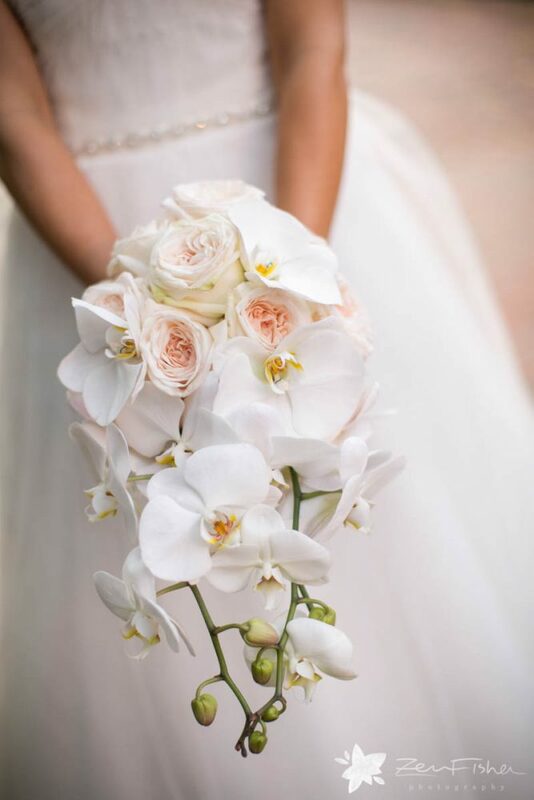 Your bridal bouquets will be a big part of your big day! 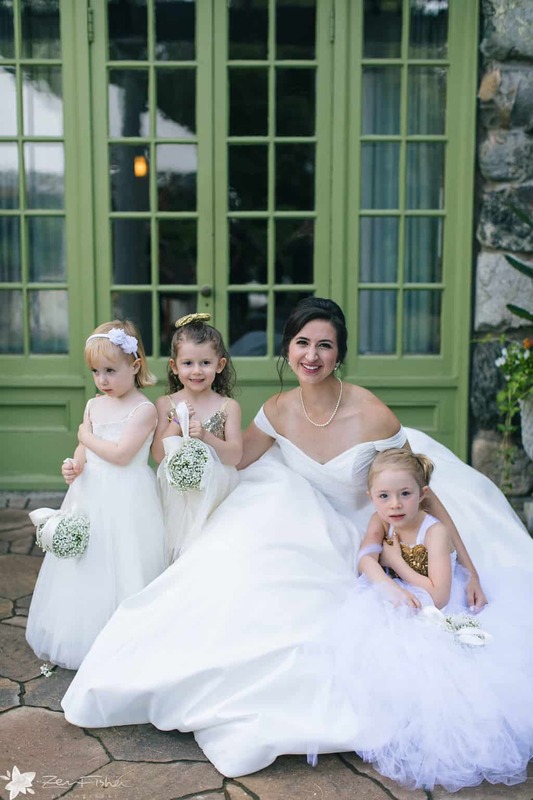 Not only will you flaunt one down the aisle, but your bridesmaids as well. 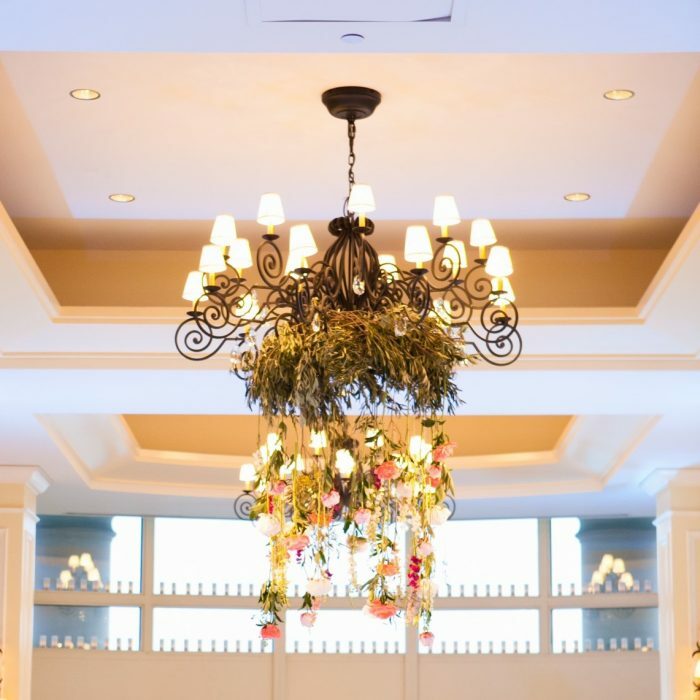 Bridal bouquets play a starring role in the ceremony, and for that reason, they should be planned to perfection! 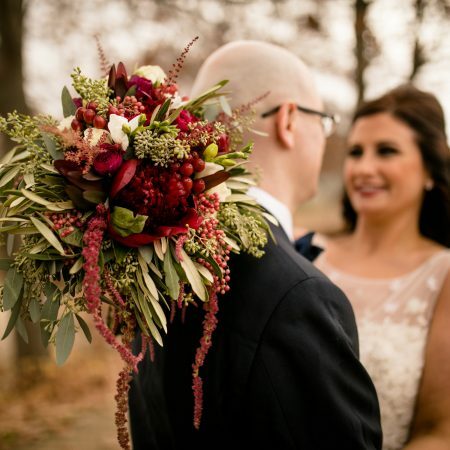 With so many bridal bouquet styles to choose from, you may be curious as to which wedding bouquet style is the best fit for your wedding. 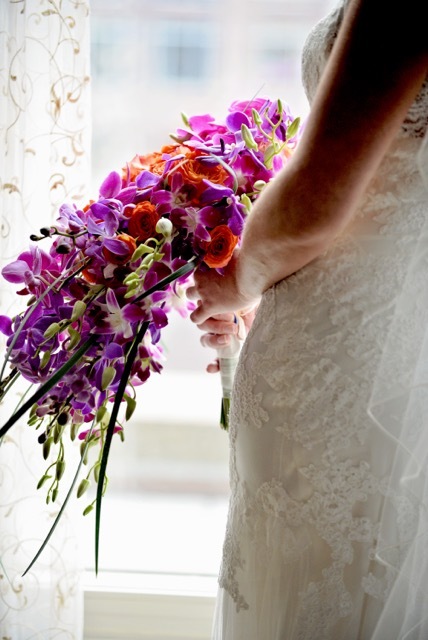 We understand just how important it is to highlight the best bouquets on your wedding day! 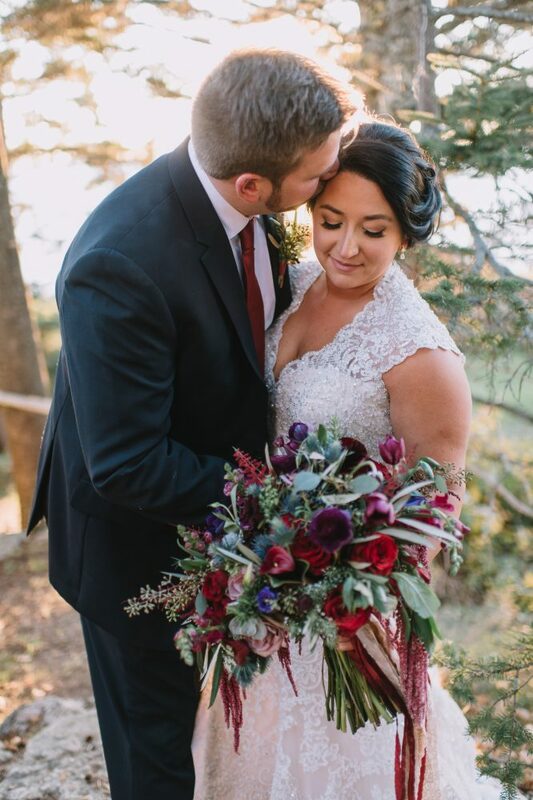 That’s why, here at Flou(-e)r Specialty Floral Events, as Boston wedding flower designers, we have gathered some of the top bridal bouquet styles that you could choose for your own wedding. 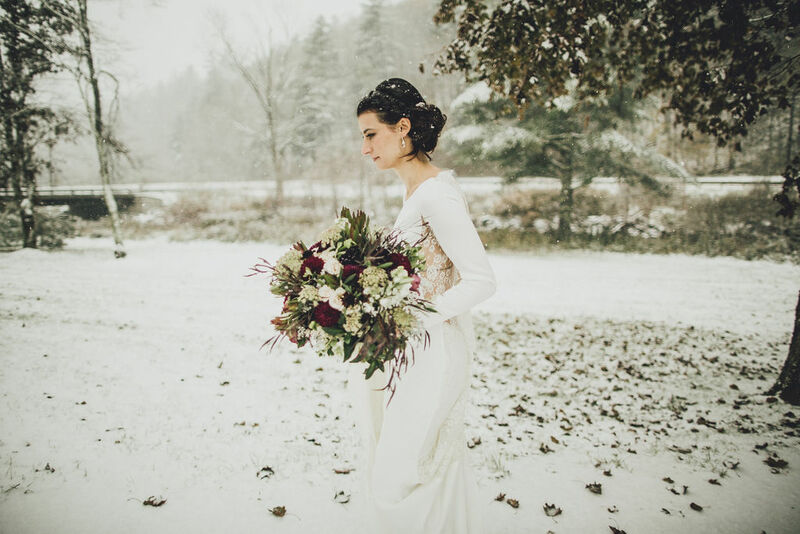 If you are seeking to showcase a traditional sense of style down the aisle, consider choosing a natural bridal bouquet. 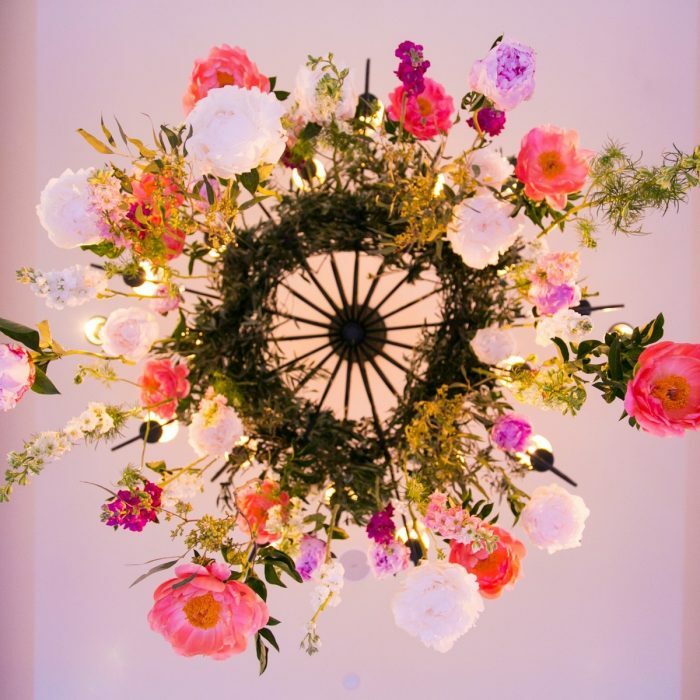 Comprised of more loosely arranged blooms, natural bouquets will highlight a more organic appeal. 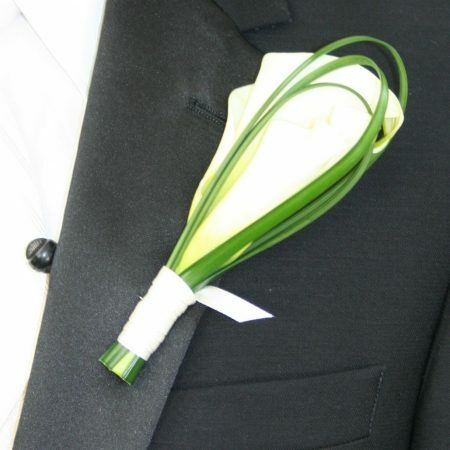 This bouquet style is certainly ideal for brides who love a focus on greenery and natural settings. 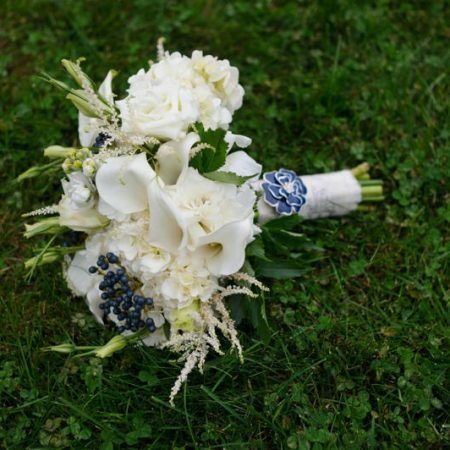 Add a wispy and romantic appeal to your walk down the aisle by choosing a crescent bridal bouquet! 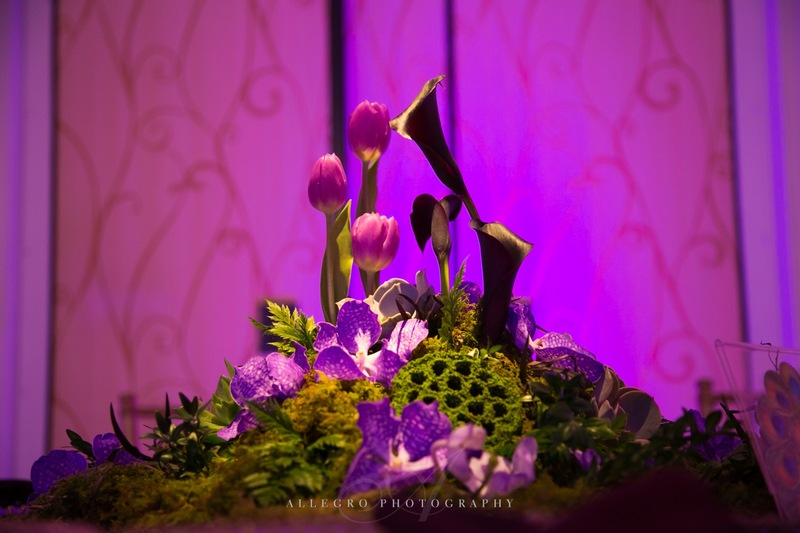 These bouquets are created with a center of compacted flowers, which then extends out of each side, creating a crescent shape. 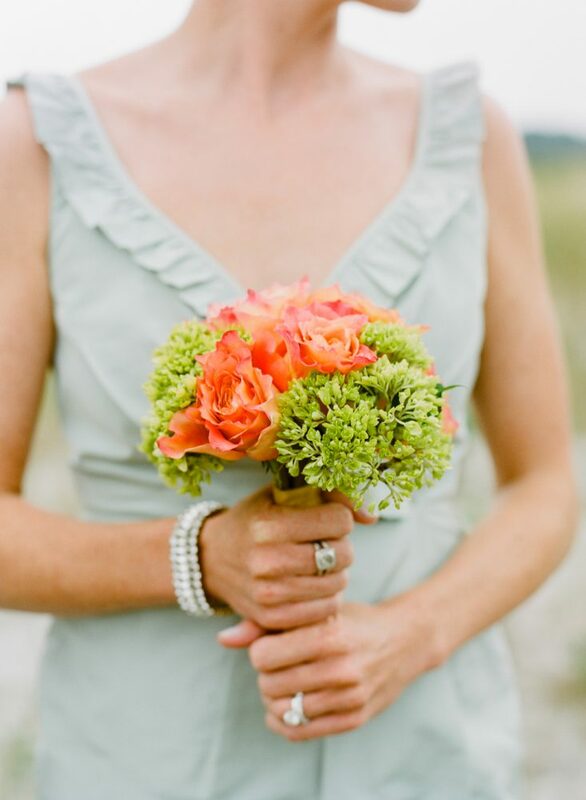 This style is best for brides in search of a classic, yet romantic bouquet style. 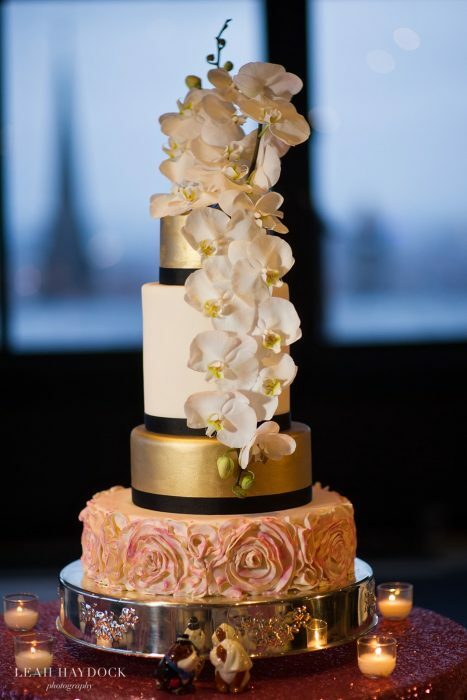 Create your bridal bouquet to appear as a waterfall of flowers by choosing a cascade style! These voluptuous bouquets will make quite the statement, therefore pairing best with gowns that showcase little detail. 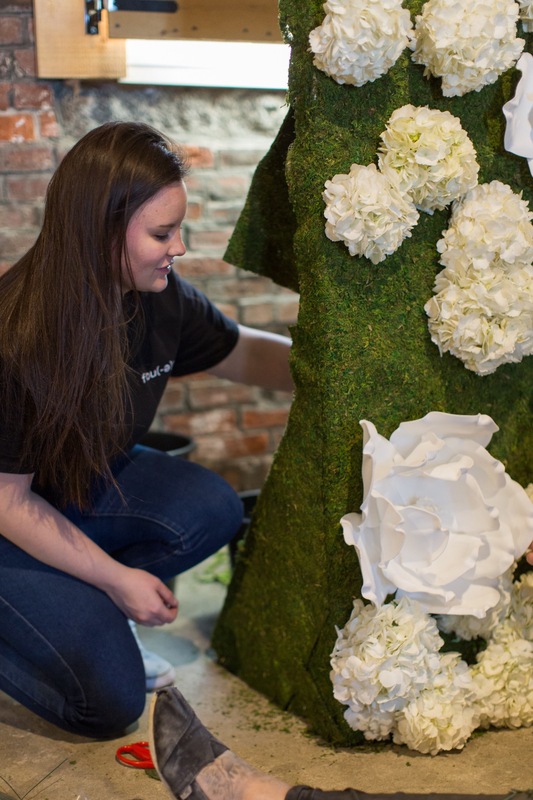 Enhanced with greenery so that your blooms will pop, you can create this floral arrangement to be a powerful focal point of your ensemble. 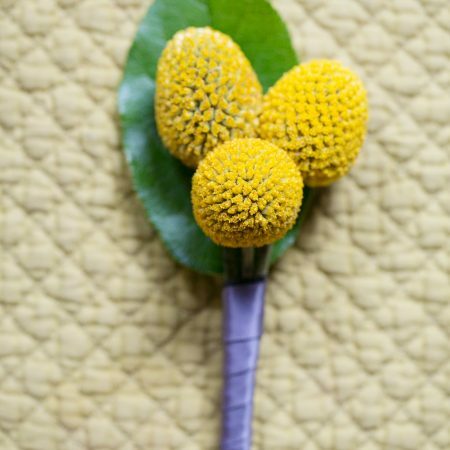 You can highlight an old-fashioned bouquet down the aisle by choosing a teardrop style! 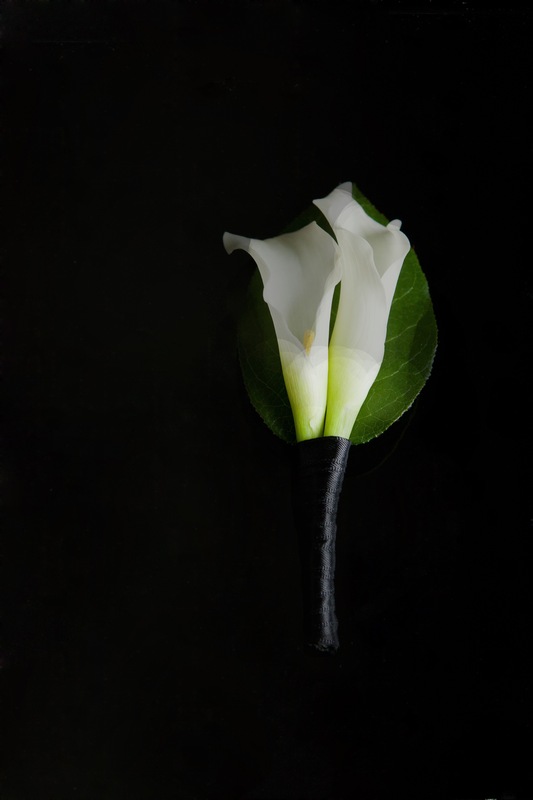 Smaller versions of the cascade bouquet, teardrop bouquets are compacted with flowers that showcase a tear shape. 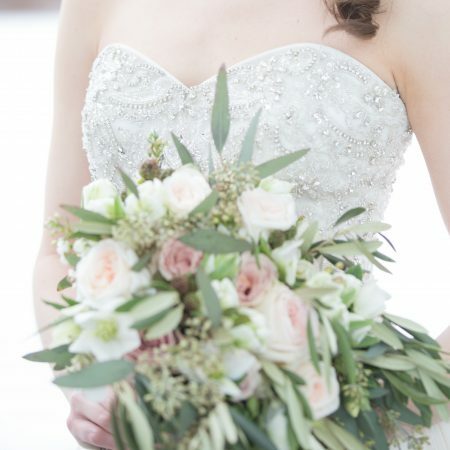 This style of bouquet is perfect for petite brides who don’t want to be overwhelmed with flowers but would still like to evoke some uniqueness when it comes to their floral arrangement. 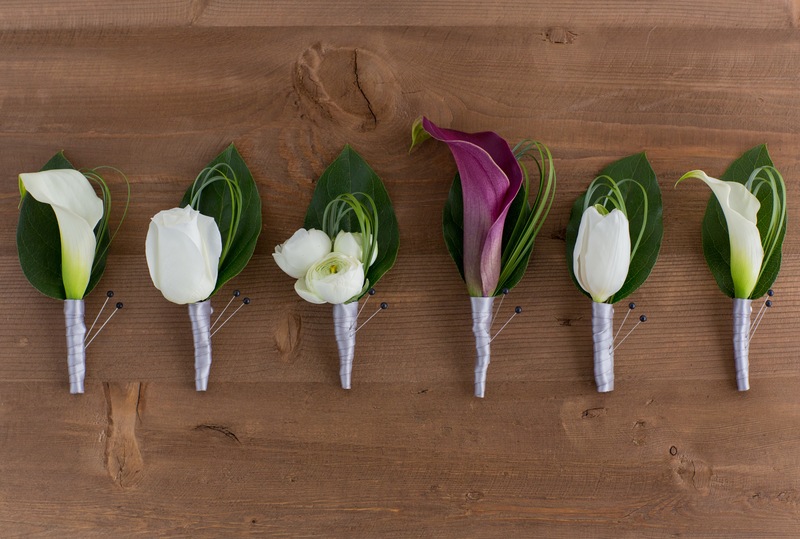 Highlight both elegance and class by choosing a nosegay bouquet for your big day! 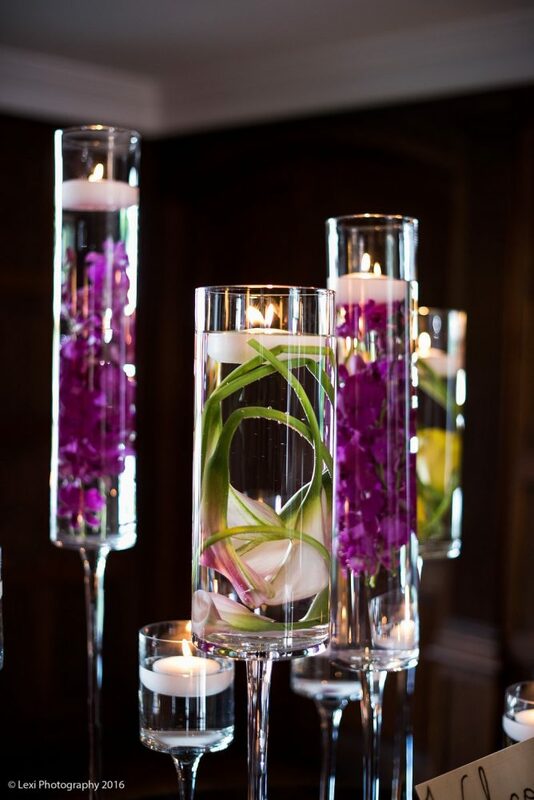 These romantic bouquets consist of a tight bunch of blooms, exposing density in a truly intimate way. 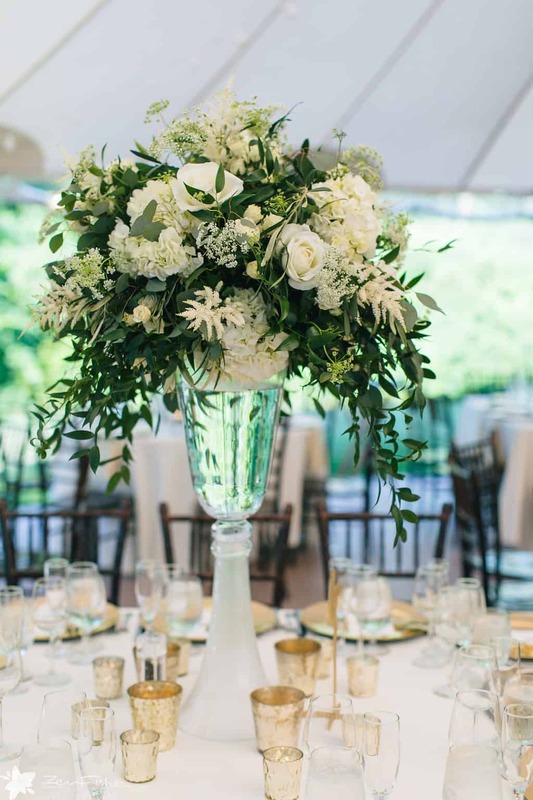 This style is ideal for brides who would like to showcase a classic floral arrangement and is paired best with traditional gowns. 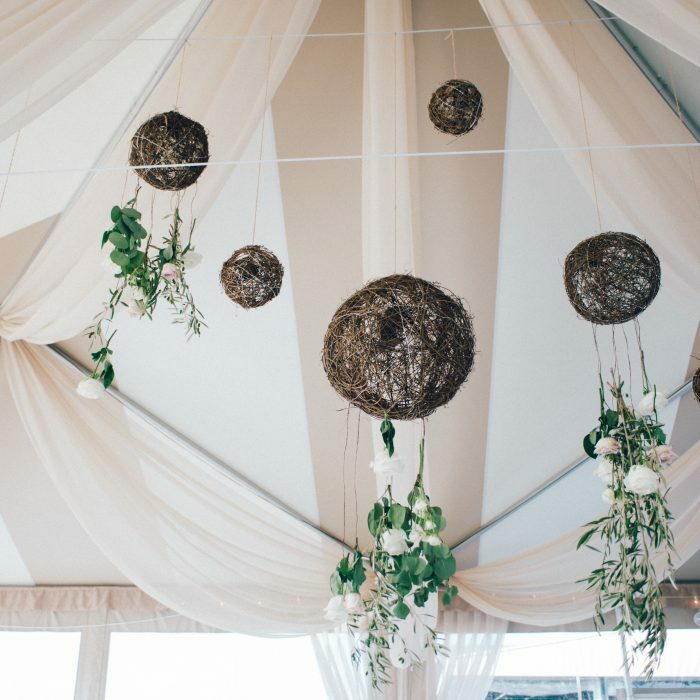 Usually comprised of one type of flower, presenting a monochromatic look, round bouquets are created to appear as perfect domes. 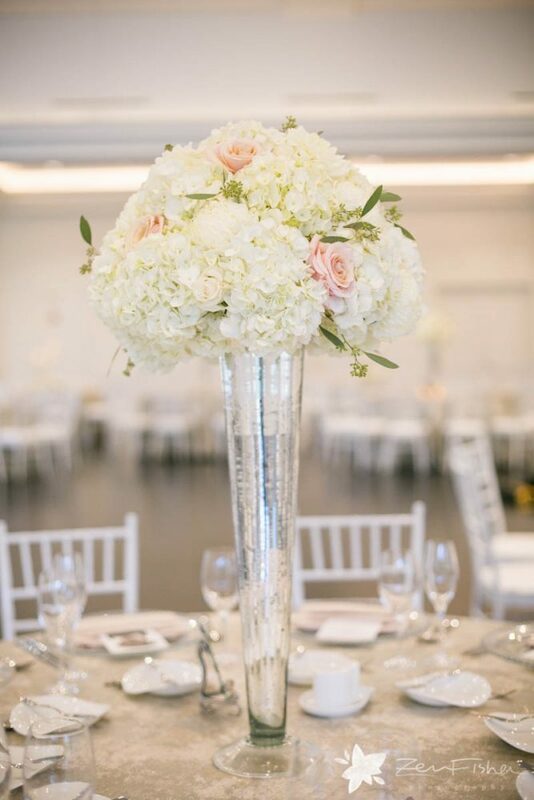 So, if you are seeking to a bridal bouquet that evokes elegance in a voluminous and simplistic way, a round bouquet would be an ideal choice! 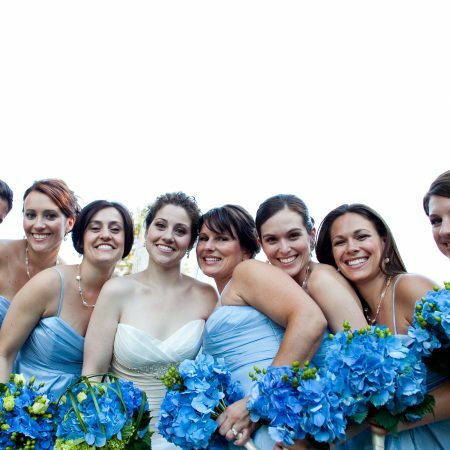 Every bride deserves to flaunt a gorgeous bouquet on her big day! These are just a few of the most popular bridal bouquet styles that you could choose for your own wedding. 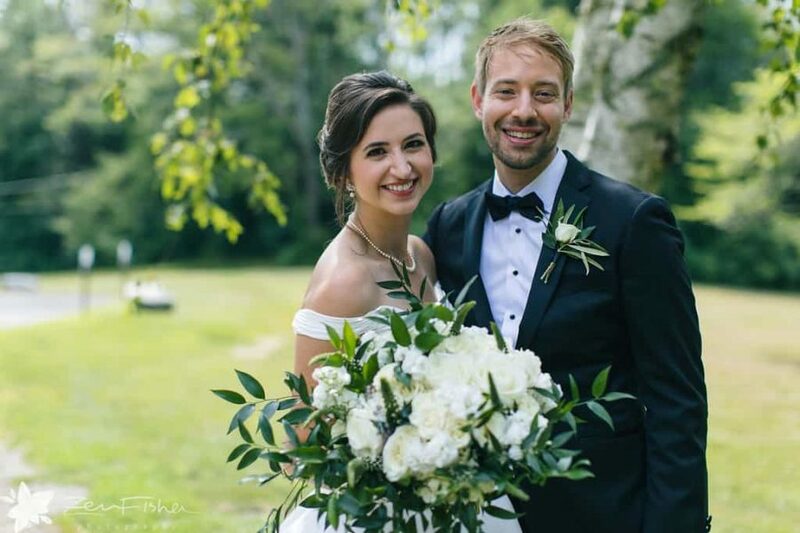 Who Else Gets Flowers on the Wedding Day? 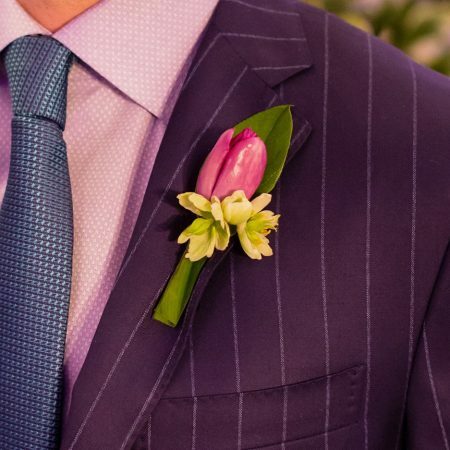 It’s common knowledge that members of the wedding party have floral accessories: the gentlemen traditionally sport a boutonniere, and the ladies hold a bouquet. 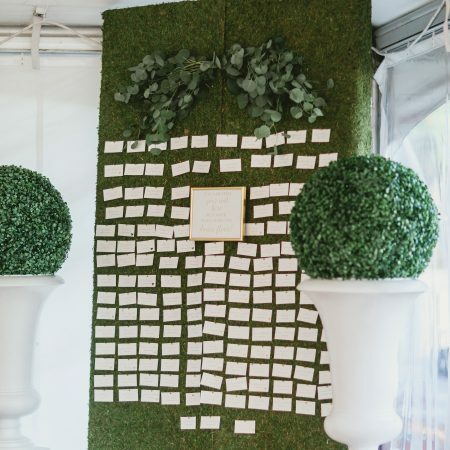 But beyond that, have you considered the options for using wedding flowers to honor guests of honor and guests with special responsibilities? Chances your mother (and grandmother, too!) 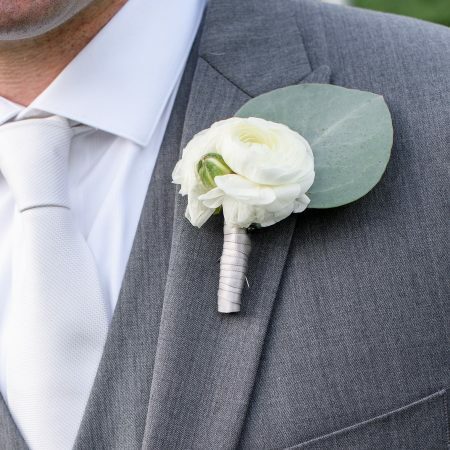 have put a lot of thought into what they will wear on your wedding day – the perfect accessory for their wedding day attire would be a floral piece designed just for them! 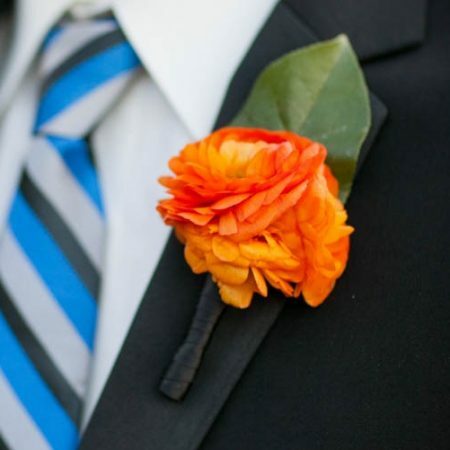 The flower options for a mother of the bride and/or groom and grandmother (as well as other ladies) are endless, but we have some favorites to share! 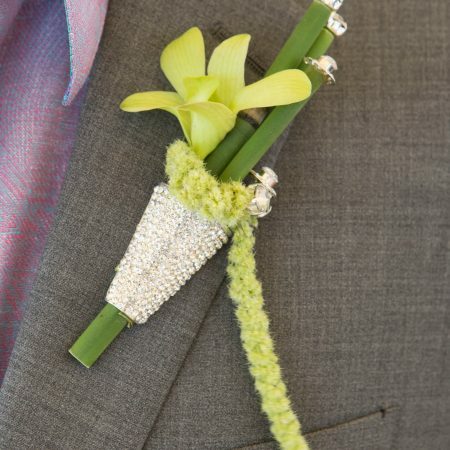 Consider a wrist corsage. 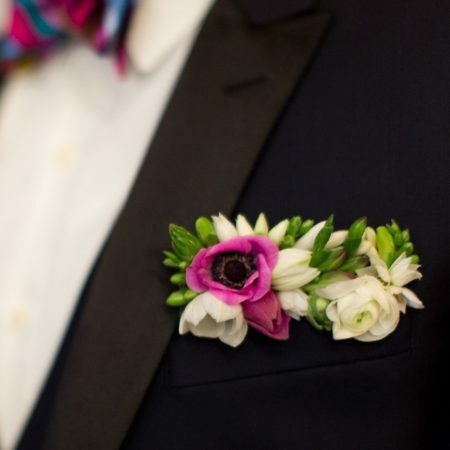 Here at Flou(-e)r, we design wrist corsages on either a pearl inspired or diamond inspired wristlet – two classic options that won’t take away from the beauty of the flowers and attire. 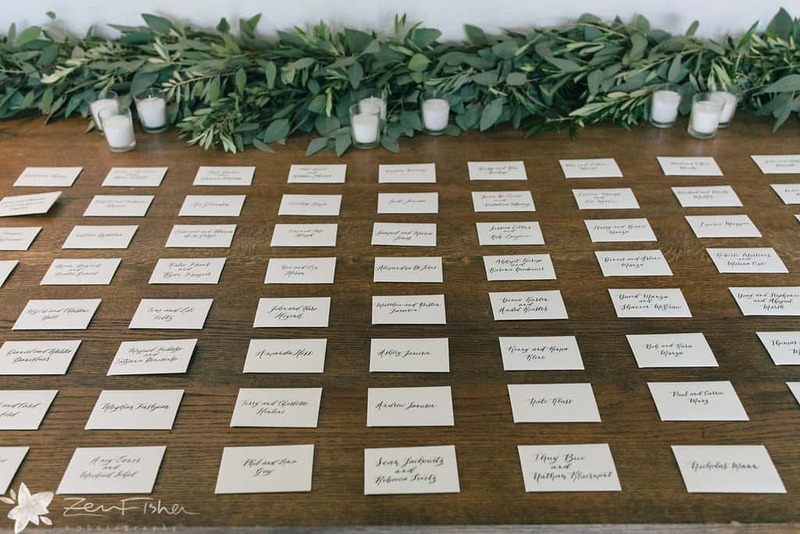 If mom has a speaking portion at any point during the celebration and would be reading off a piece of paper, a pin-on corsage or one of the following options may be a better option. 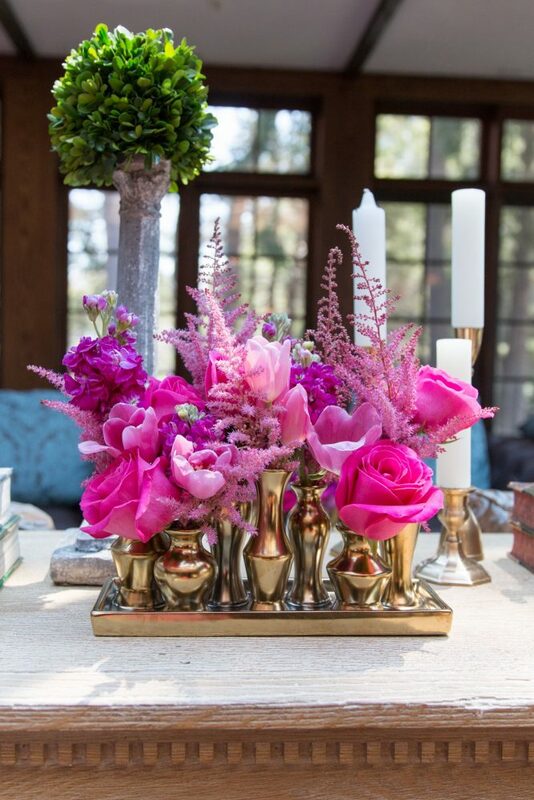 Modern moms love the posies we design for them! 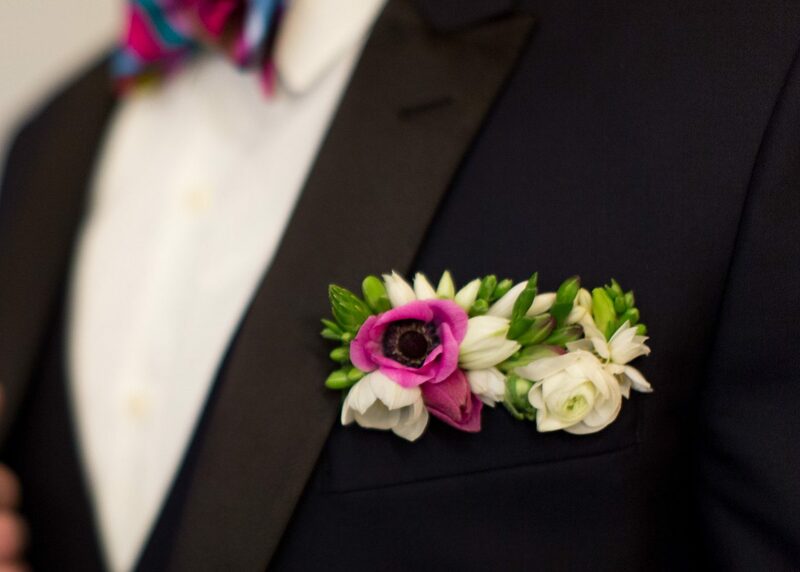 Posies are a small bouquet and are a great option for moms – they can hold them during the processional and for photos, and because of their small size, they can be left table side during toasts. 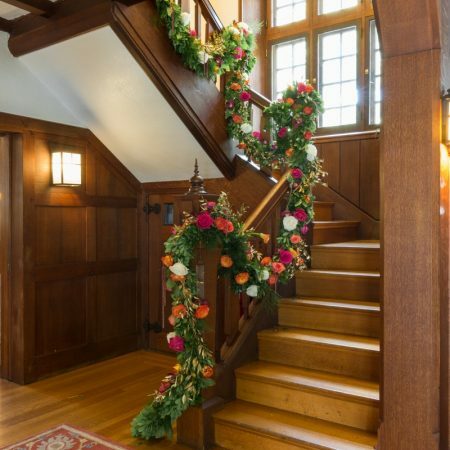 You may also know posies as nosegays, another common term for the arrangement. We can design a floral piece and attach it to mom’s clutch or purse. 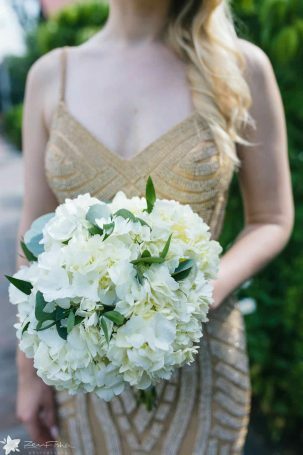 This option requires a little advance planning – the purse must be cloth so we can secure the florals onto the bag so they don’t go anywhere during the big day! 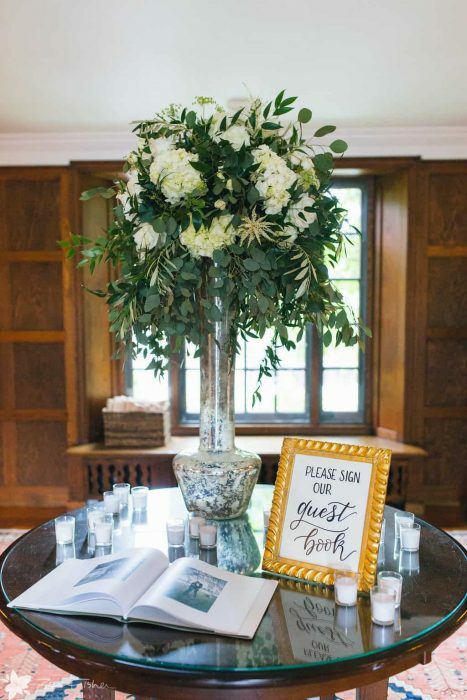 If you have any guests that will be reading during your ceremony, consider designating them as a guest of honor with flowers. 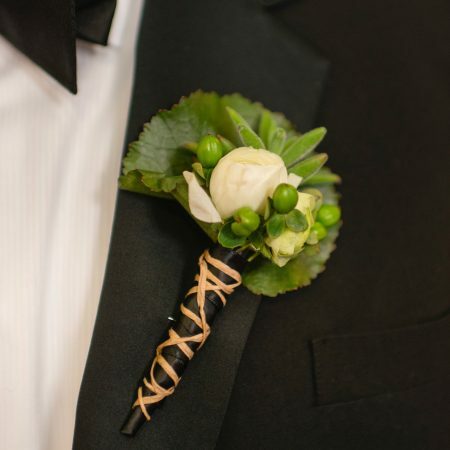 For the gentlemen, we can design a smaller version of the groomsmen boutonniere. 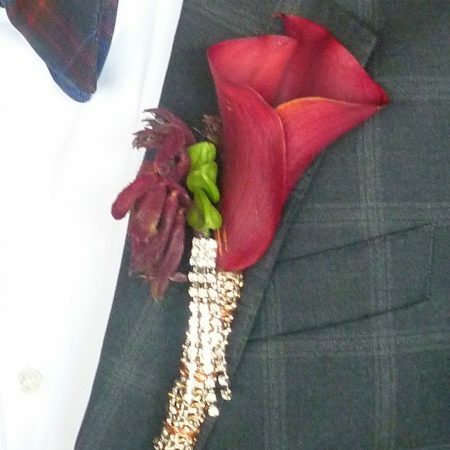 For the ladies, a pin-on corsage is a great option. 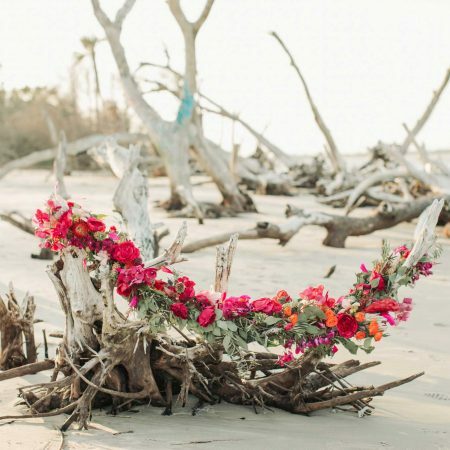 In addition to the above options, consider embellishing your hair with a floral statement piece. 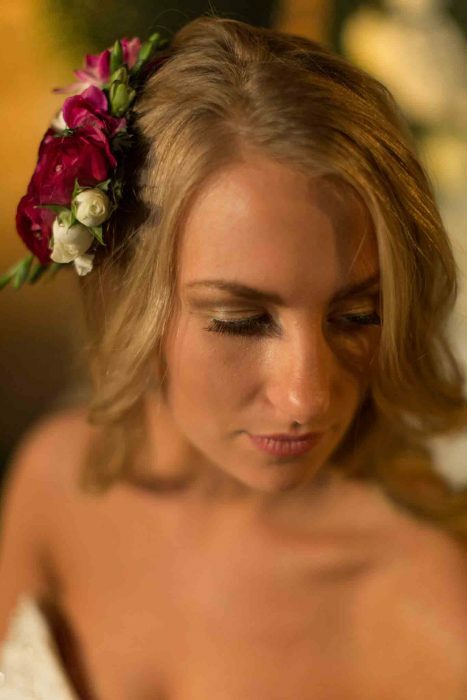 Adding flowers to your hair will call attention to the details of your wedding hair – you’ll spend a good amount of time with hair and makeup on the morning of the wedding, so you should show it off! And don’t forget your furry family! 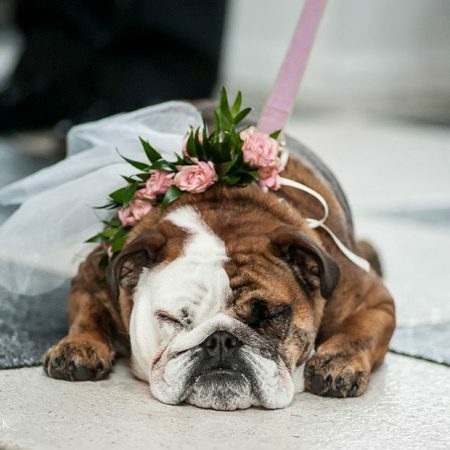 We so love designing floral collars and even leashes for the canine guests at your wedding. Plus, can we say photo opportunity?! 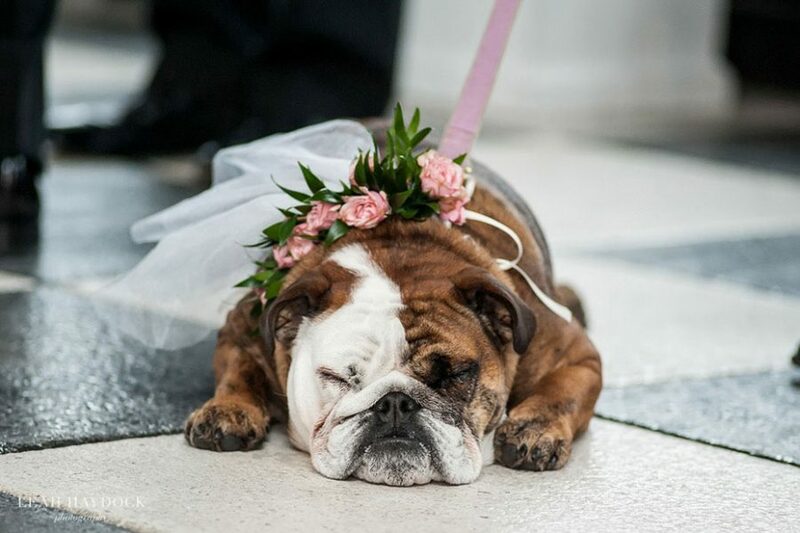 Dogs sporting wedding flowers always seem to get the attention of wedding photographers. 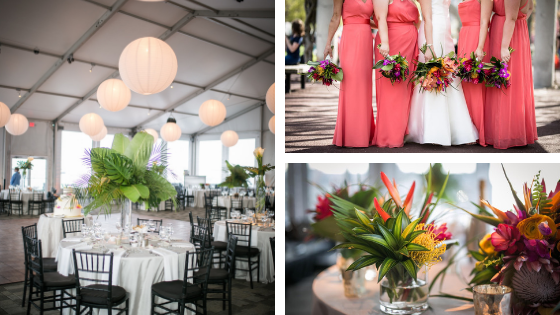 Today we want to share a beautiful Willowdale Wedding we had the pleasure of designing this year. 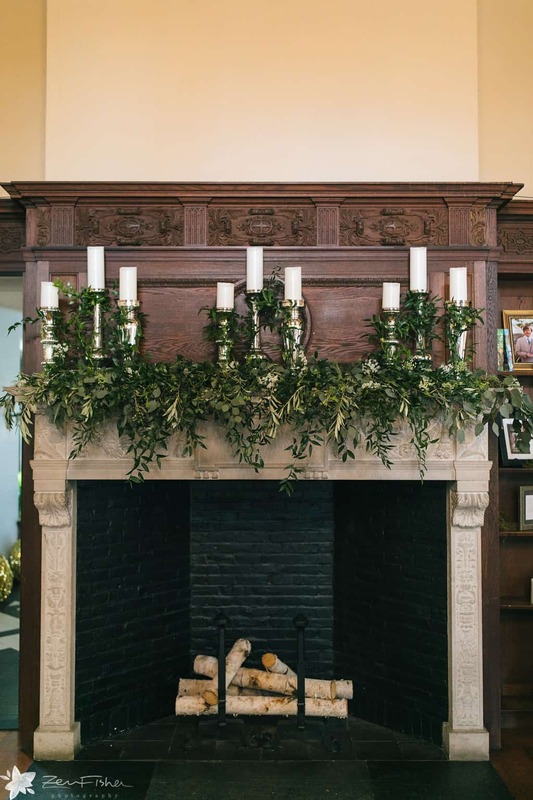 We worked with bride Kathryn and groom John to create a floral design that felt natural and authentic to venue – the beautiful Willowdale Estate. 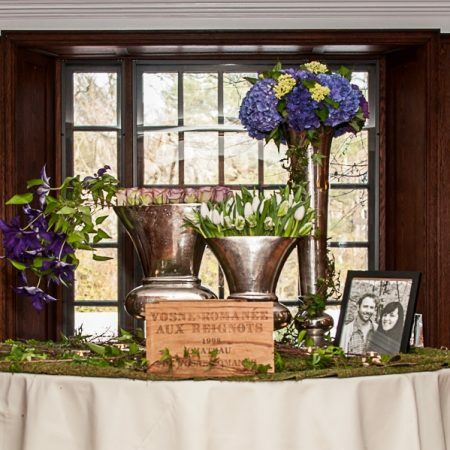 Upon arrival, guests were greeted with a tall arrangement in one of our silver mercury glass vessels. 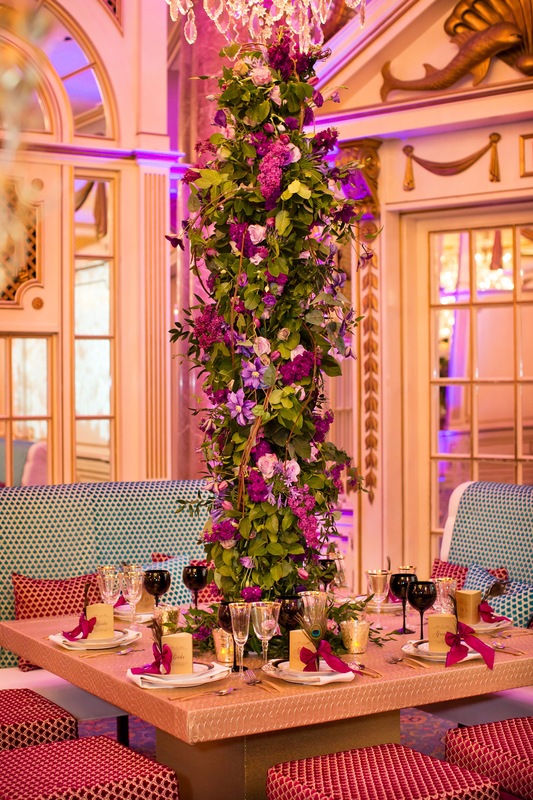 Tall wedding arrangements are a great way to add some drama without taking up too much surface space – a great option for guest book table flowers – we’re still able to add some floral elegance without cramping the area for guests to leave their well wishes. 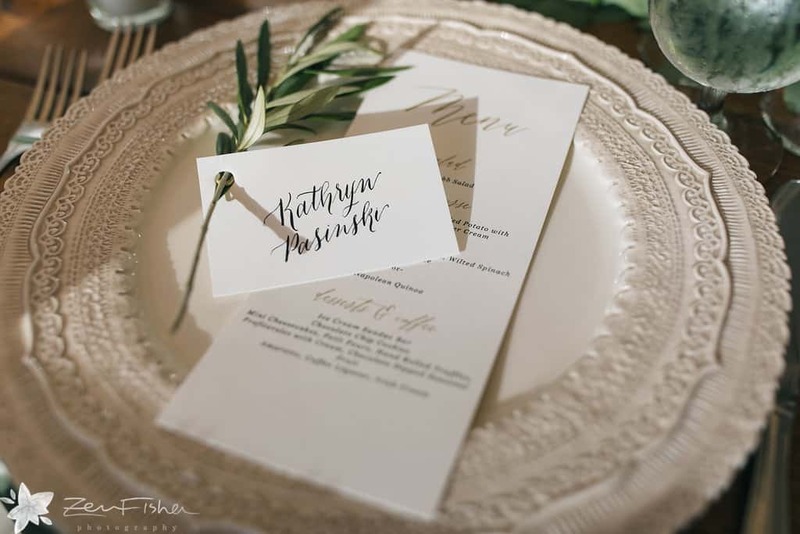 Kathryn and John injected so many personal details into their wedding day and we were thrilled to help make their vision come to life. 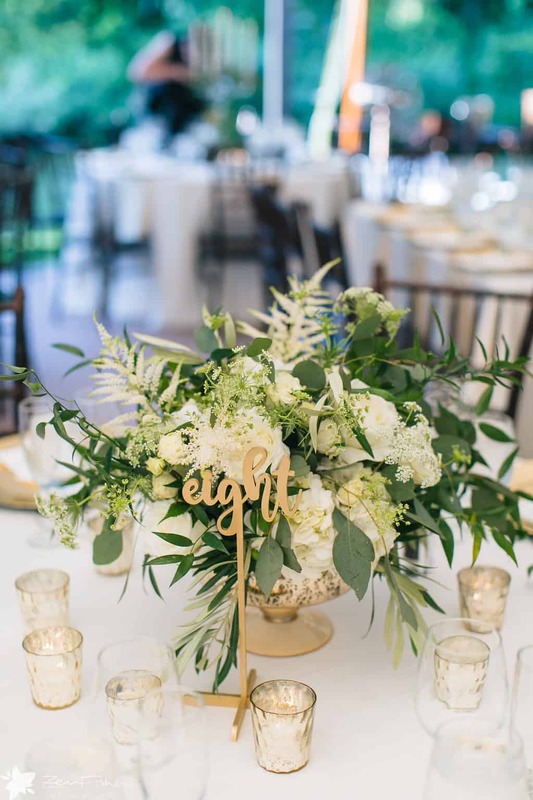 To complement the couple’s classic wedding style, we worked with greenery and traditional white florals for a timeless, elegant wedding. 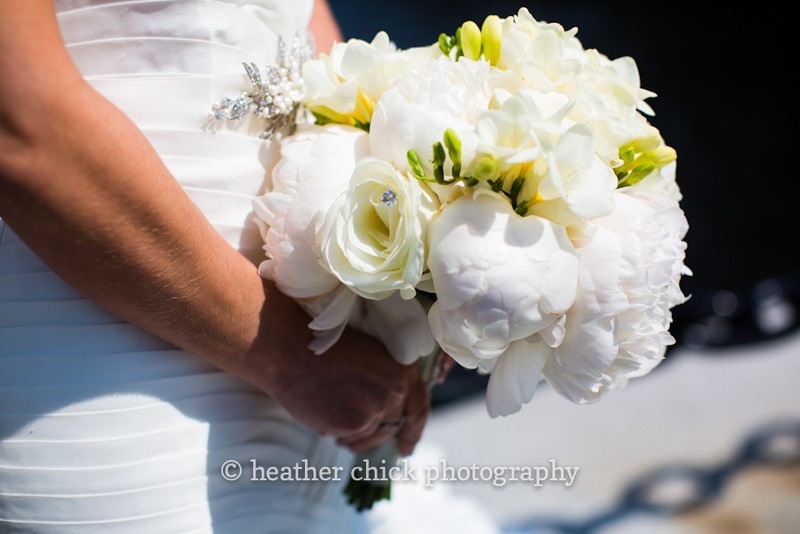 Kathryn’s bouquet was created with italian ruscus, white garden and spray roses, hydrangeas and white lysimachia. 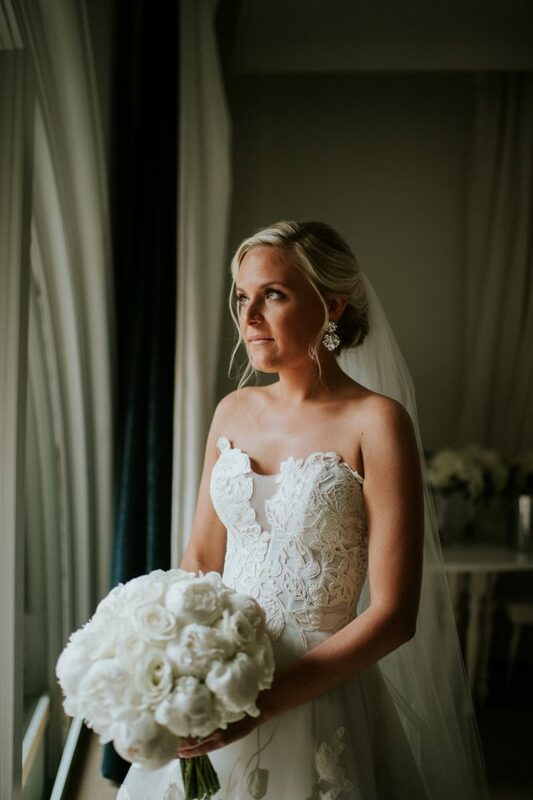 In keeping with the natural theme, we kept the arrangement loose and full, in perfect proportion with Kathryn’s stunning bridal gown. 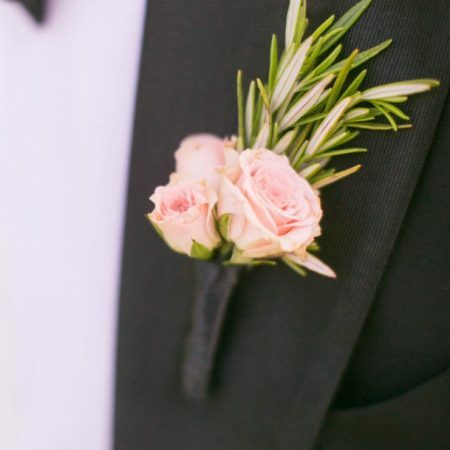 John’s tuxedo was enhanced with a similarly constructed groom’s boutonniere, composed of a single white rose and loosely arranged olive greens. 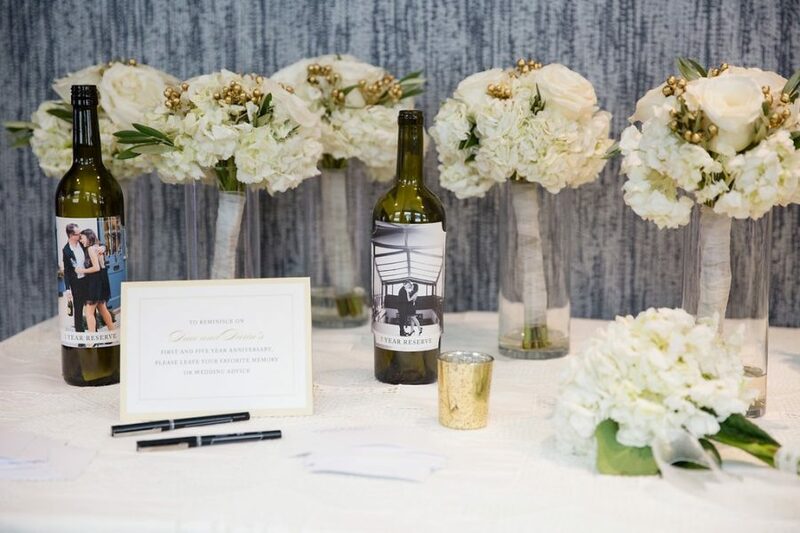 For the bridesmaids, we designed a predominantly white bouquet of hydrangeas, with a hint of greenery, utilizing italian ruscus and eucalyptus. 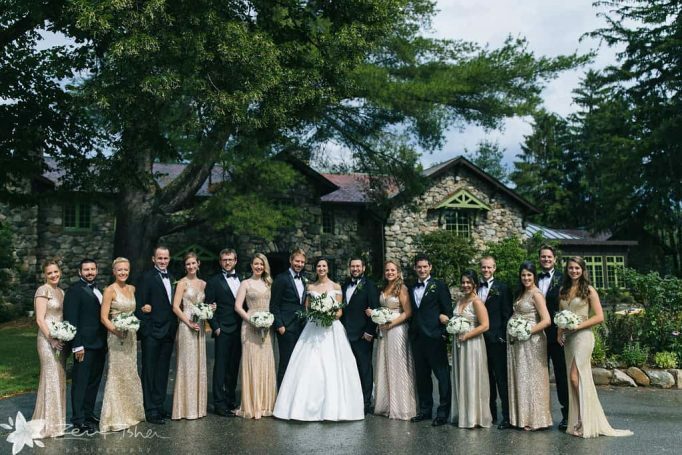 Look how stunning this wedding party is! 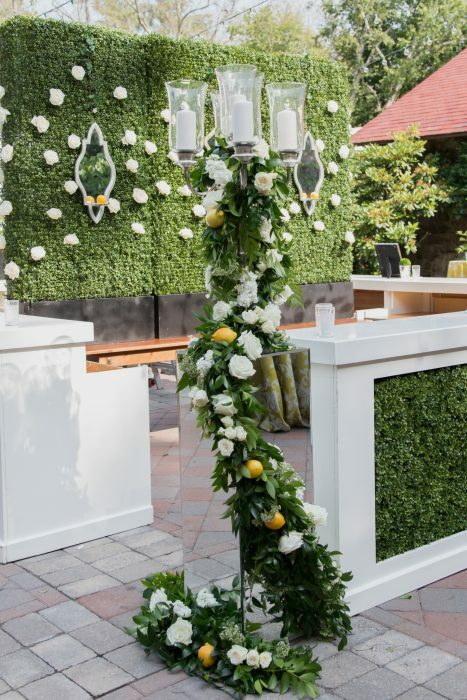 Wedding ceremony flowers carried the same color story and classic floral design: we defined the aisle with white rose petals and marked each row with alternating bunches of greenery and white hydrangeas with flowing ribbon. 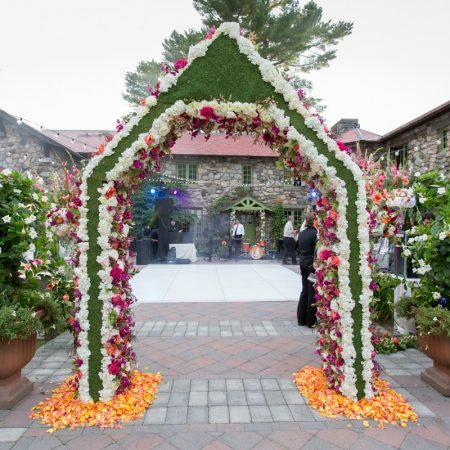 The flower girls carried baby’s breath pomanders and if the ceremony arch looks familiar to you, that’s by design! 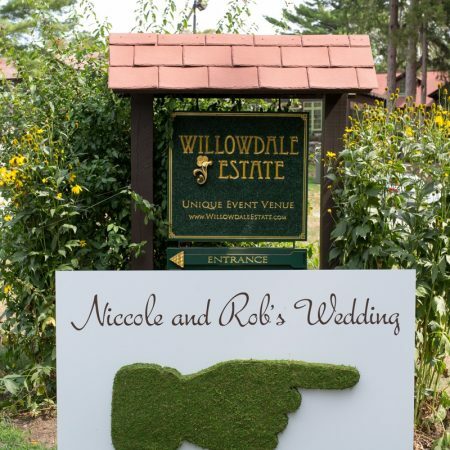 We used the same greenery combination and florals from the tall welcome floral piece and draped the design over Willowdale’s beautiful wooden wedding arch, creating a familiar look for guests to enjoy. 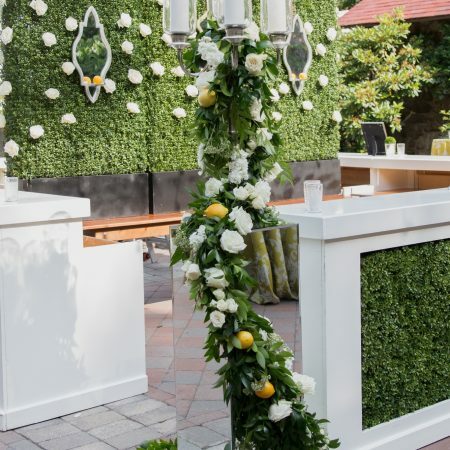 One of the many reasons we love designing Willowdale weddings is because of the house – there are so many surfaces and visually interesting areas of the home for us to “dress up” with florals to create a visually stunning backdrop for cocktail hour and wedding party portraits. 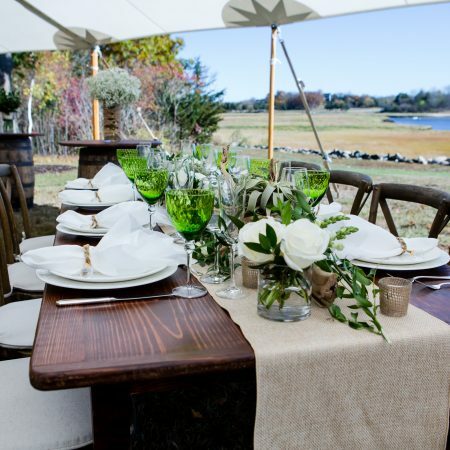 We especially love the wooden details and farm tables! 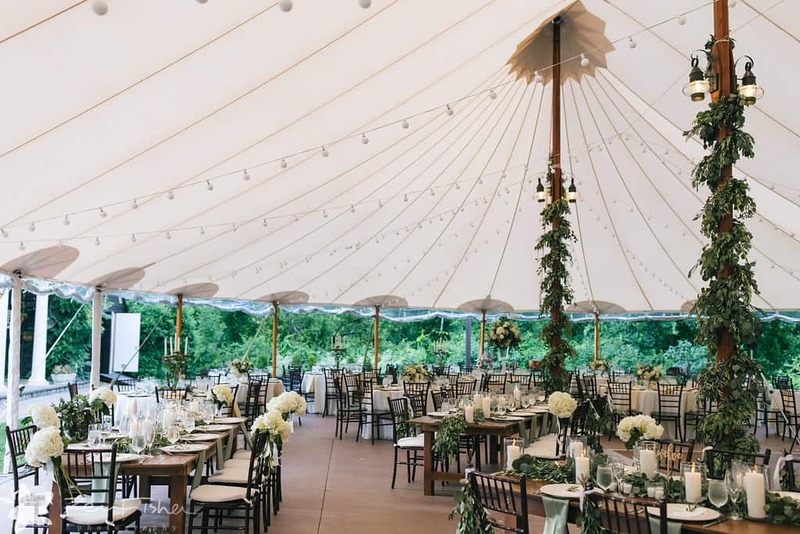 Finally – the tented wedding reception was nothing short of remarkable. 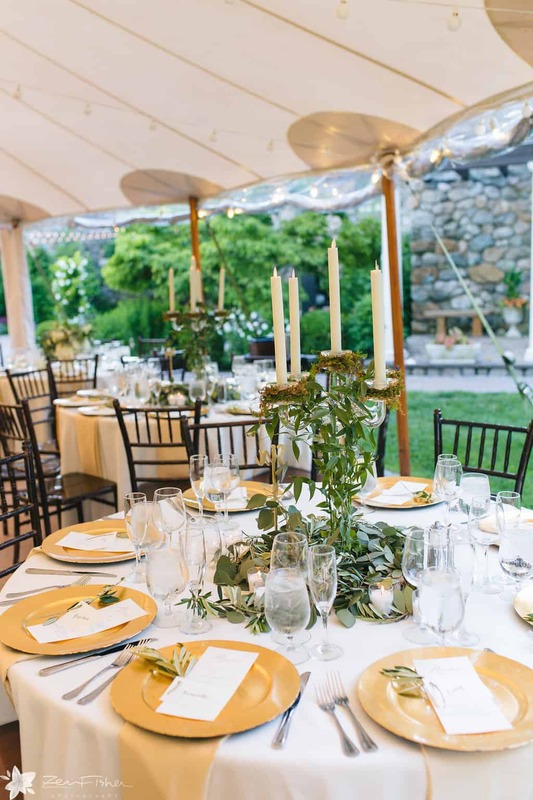 From place cards garnished with a sprig of olive greens, to greenery wrapped tent poles and candlelit tables, Kathryn and John’s wedding reception was simply extraordinary. 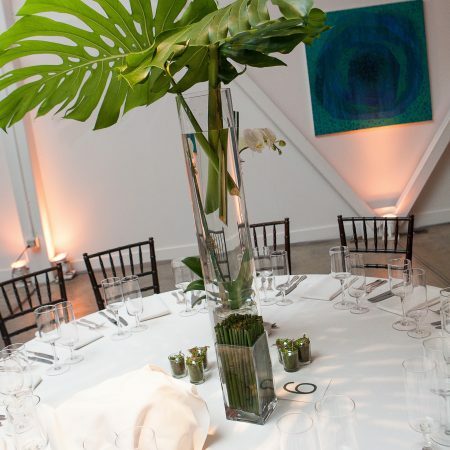 We designed a combination of centerpieces – some with our crystal candelabras wrapped with italian ruscus, others were designed in mercury glass compote bowls, (footed bowls), some tall arrangements in our glass vessels and long greenery garlands for the rectangular farm tables. 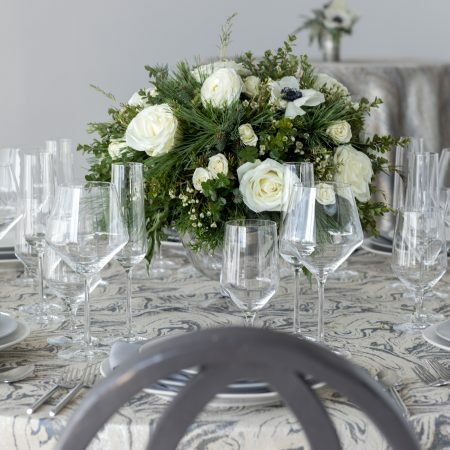 We also designated guests at the head table with floral arrangements tied to their chairs – a great way to dress up the head table and show extra appreciation for wedding guests of honor! 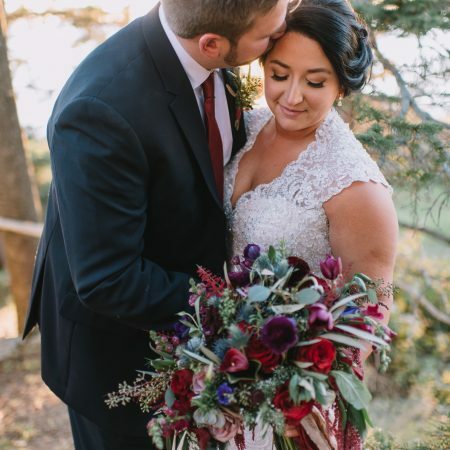 We’re delighted to share that Kathryn and John’s nature-inspired wedding has been featured by Boston Weddings Magazine! It may be fall, but it seems appropriate to “do the time warp” on this Halloween and share with you some tropical work from the summer. 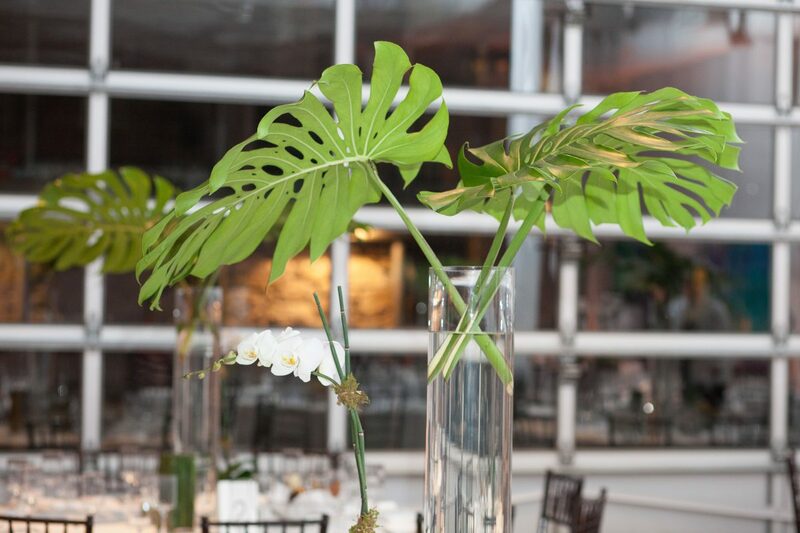 Kelly and Michaels’ New England Aquarium wedding took place during a beautiful spring day in Boston. 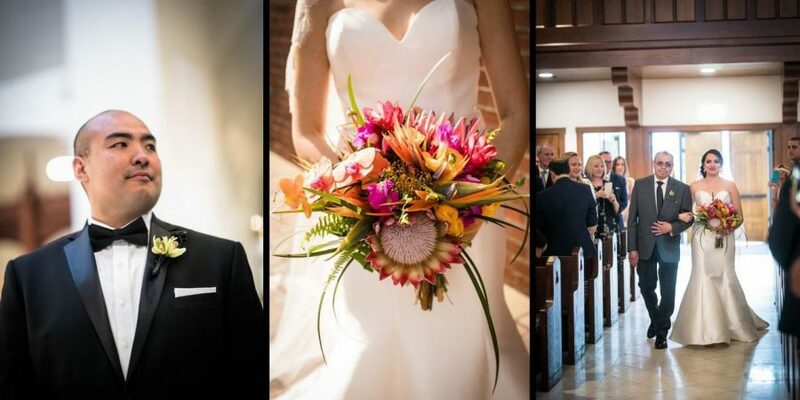 The sun was shining and complemented the colorful vision this couple had for their tropical wedding flowers, we were so excited to design a tropical wedding! Fabulous images, as always, taken by Dan Aguirre. 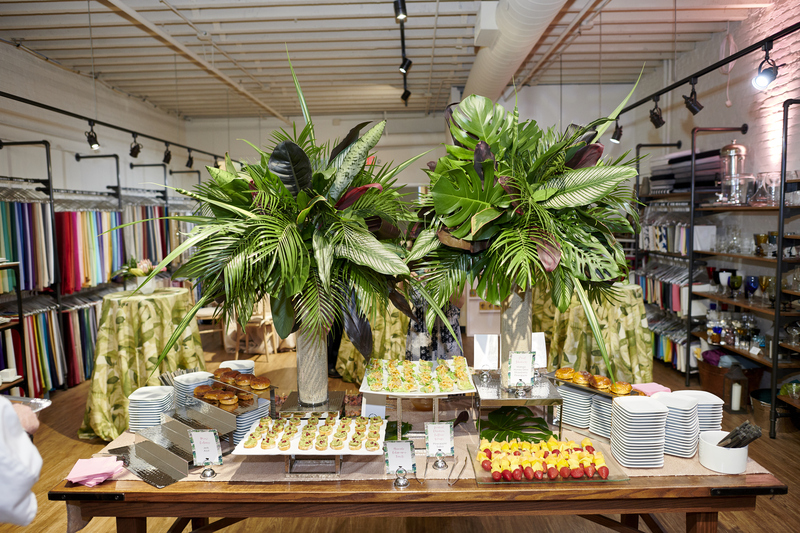 Our team loves working with blooms that we don’t see on a regular basis, so naturally we were excited for tropical requests – and it was such an honor to be invited to design for the Party Rental LTD Open House at their Boston showroom – the theme was perfect – pink, and tropical. 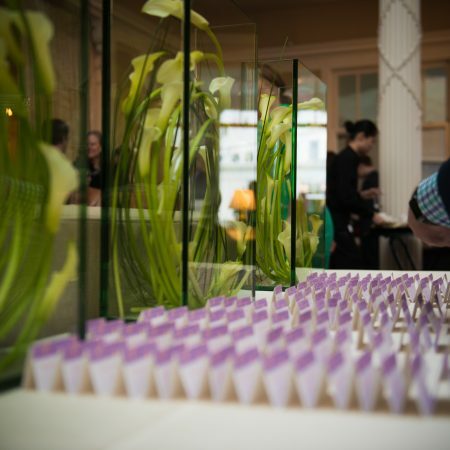 For this event, we wanted to create statement pieces that would draw attention in a crowded room, as well as some low pieces for the tables to allow for conversation, which is really important when designing networking event flowers. 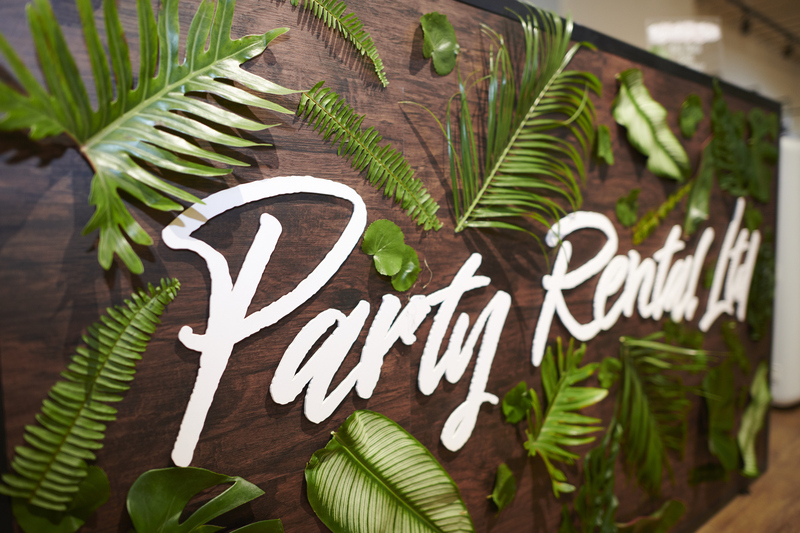 We also wanted to stay on brand, Party Rental LTD has a great brand, complete with a signature “Pink Hippo” – so choosing a color palette was easy. 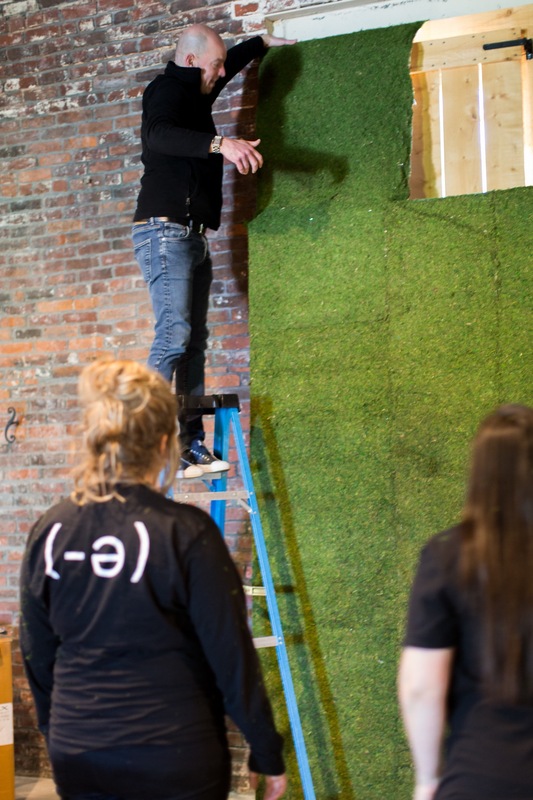 Photos by Mark Scardilli. 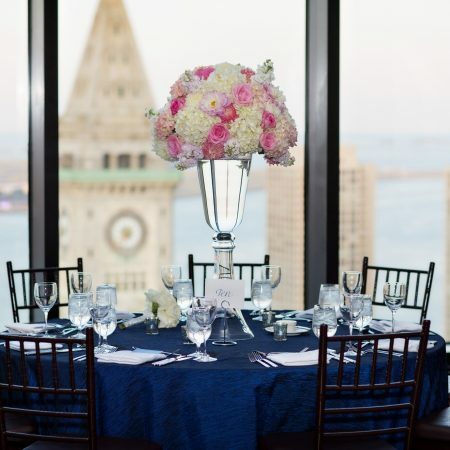 One popular request we get from clients when we meet at an initial consultation is for blue wedding flowers. 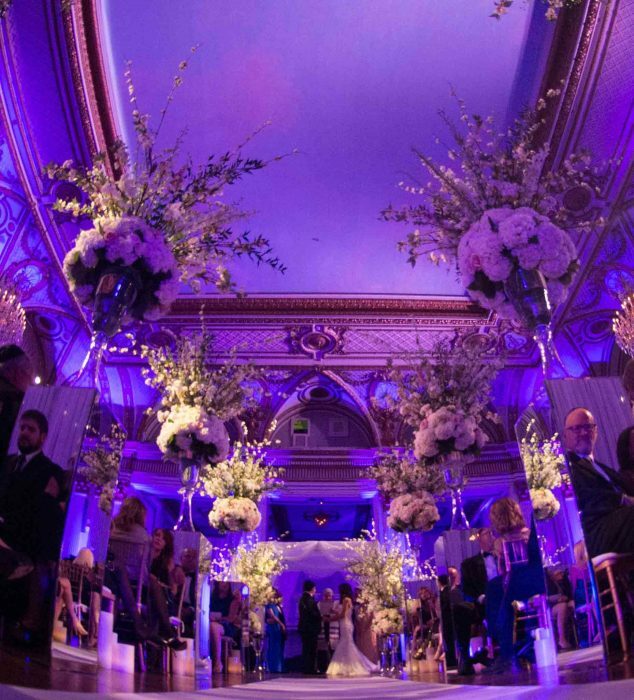 Blue is a popular wedding color selection and so it makes sense couples will want to work their wedding color into the floral design of their day. 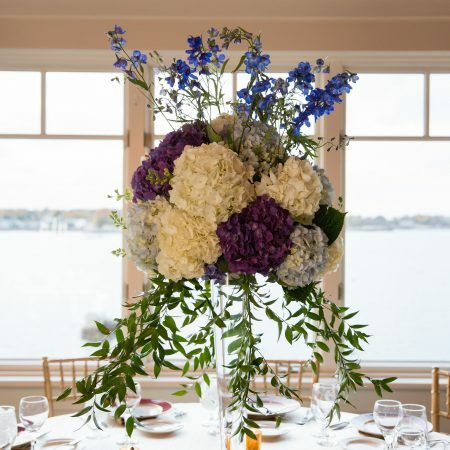 Hydrangeas grow locally in Spring and Summer and are large blooms that are popular options for couples who are planning a nautical or beachside wedding, as hydrangeas are commonly grown along coastal properties. 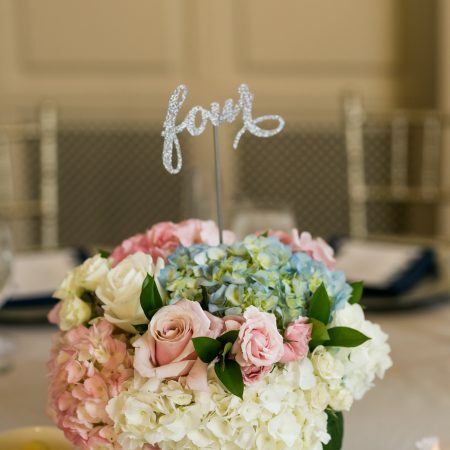 Hydrangeas are a popular option for both centerpieces and bouquets. Even though hydrangeas are local in the Spring and Summer they can be sourced year round from other parts of the world. 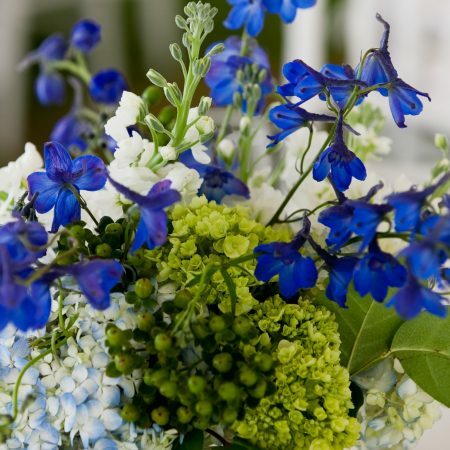 Delphinium is a vertical bloom, so it is tall stems full of delicate, star-shaped blooms. 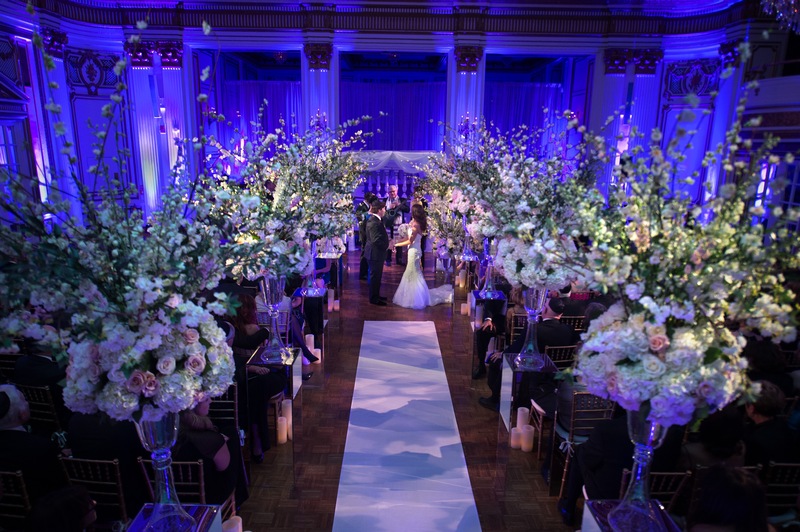 It is a great option for couples who want florals that complement a garden style and are available in both light and darker shades of blue. Berries are a great way to incorporate locally sourced, blue color into your wedding bouquet. Viburnum berries and elderberries are popular blue options. 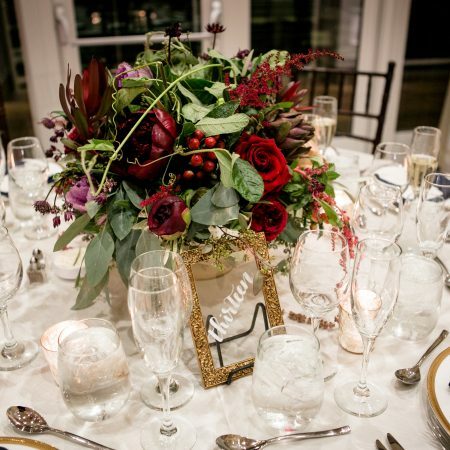 We think berries make a great, unexpected accent piece for your wedding flower arrangements. 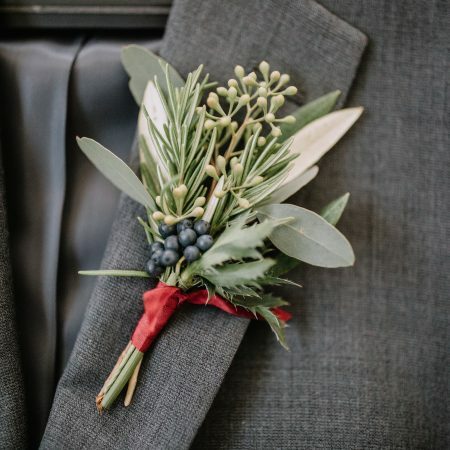 If you’re working with a deeper blue, such as a navy-blue wedding color, berries are a great option to match your colors. 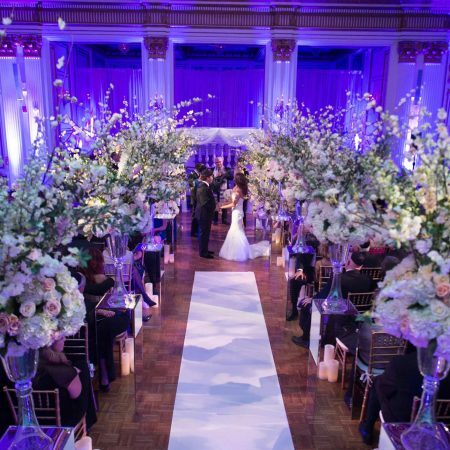 Blue irises are believed to symbolize hope and faith, so naturally, they are an excellent option for your wedding flowers. Irises have delicate petals that open fully to display a bright yellow color in the center. 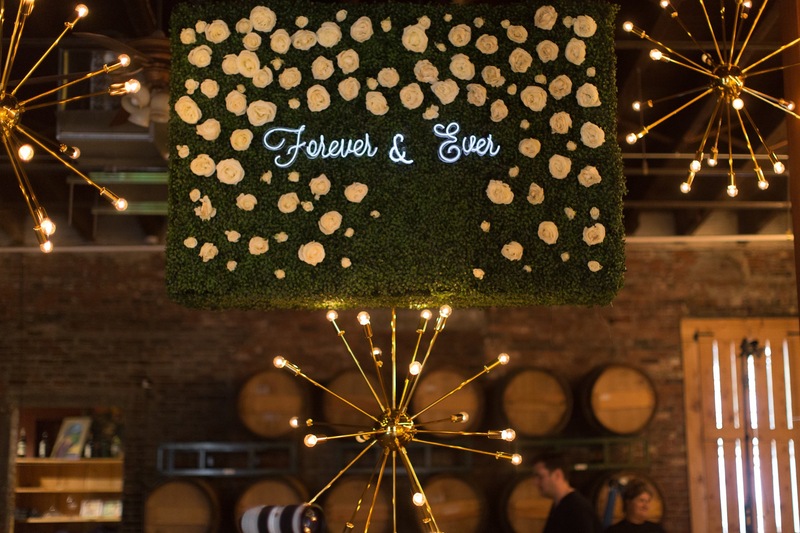 Blue thistle is an accent flower that will add some “funk” to your wedding flowers – it is a spiky, snowflake shaped flower that is available in a light to dark blue hue. 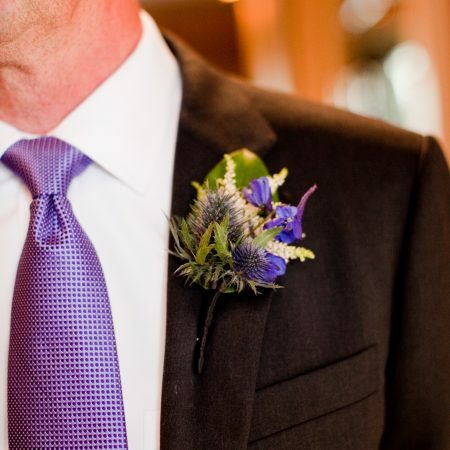 Blue thistle is not a classic, but it is a fun accent flower to consider for your blue wedding bouquet. 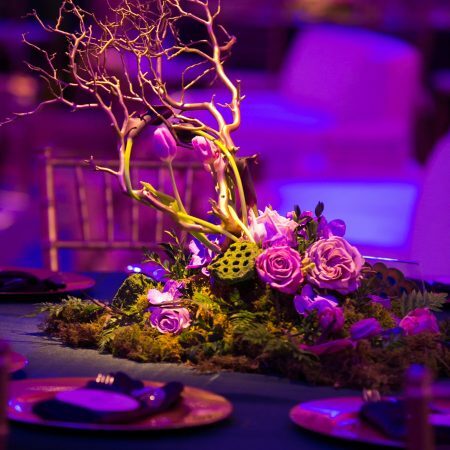 We encourage you not to limit yourself when it comes to dreaming up your wedding flowers – there are many other ways to incorporate your color into your wedding flowers other than limiting yourself to specific colored blooms. 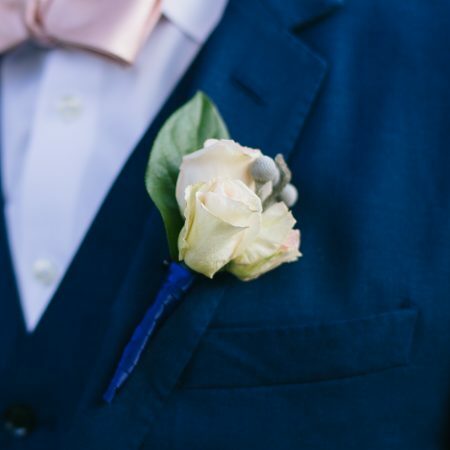 Some examples include wrapping your stems in a blue ribbon, fastening the fabric using blue pins, or adding blue accent gems to your bouquets (or even on your hair combs if you are adding florals to your hair). 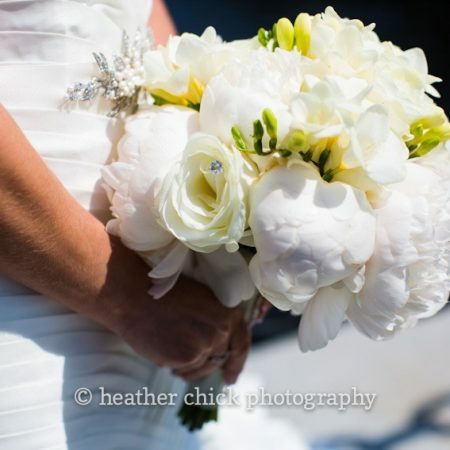 Let’s talk peony wedding bouquets! 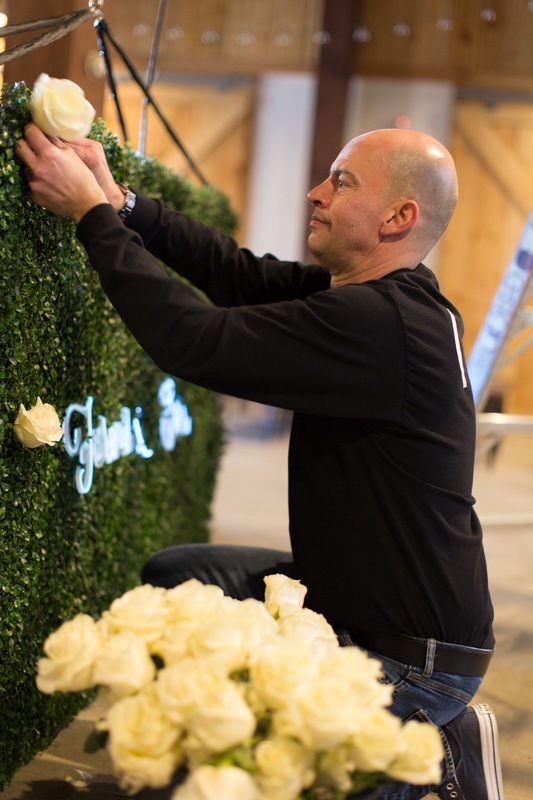 Peonies are popular wedding flowers and are in season now for only a short time frame from late spring to early summer, and we love working with them whenever we can. 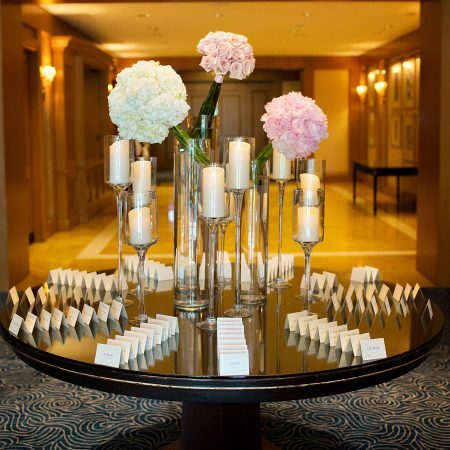 Peony wedding flowers are a classic wedding flower option, available in a variety of colors, and for those who appreciate tradition and history, peonies symbolize good fortune and a happy marriage. 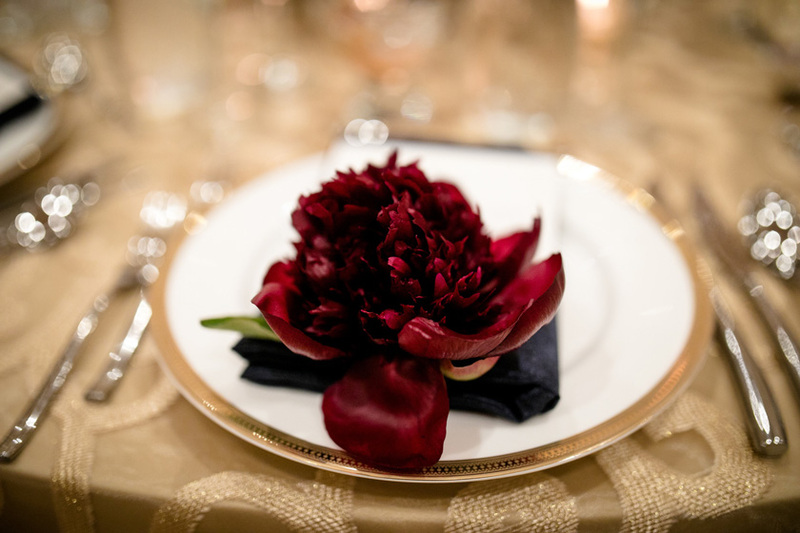 Peonies are a popular choice for weddings because of their versatility. They’re gorgeous in a bouquet all on their own, but they also work as great accent blooms in combination with other buds. Because of their versatility, both in use and color, they have become quite popular among couples. 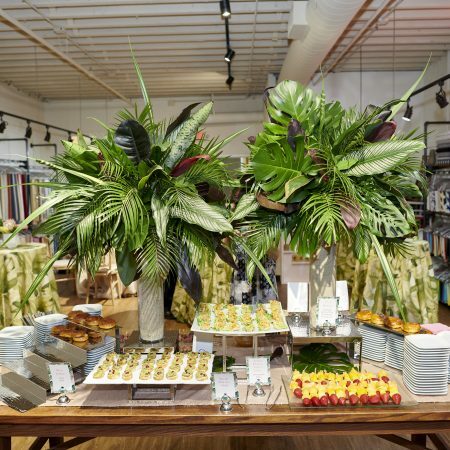 They lend to a classic or romantic style because of how lush and delicate they appear to be – however, don’t be fooled: peonies will last well through the evening and even through brunch the next morning! 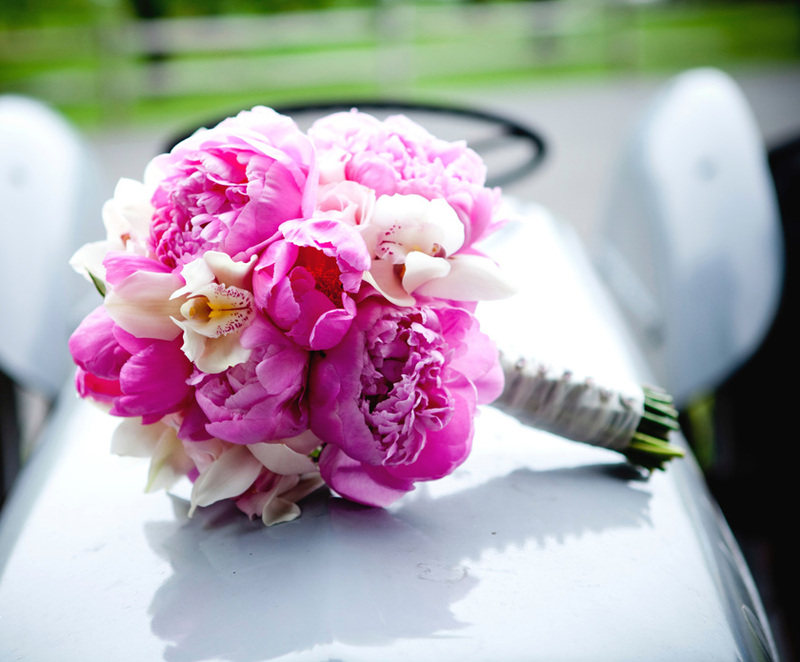 Peonies are available in a wide range of colors: from classic white, to blushes and pastels, even bright colors! 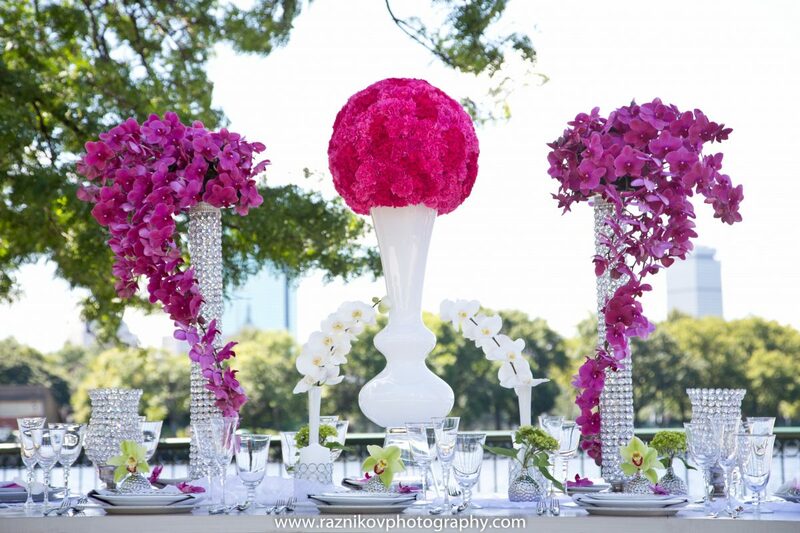 These large blooms are a great way to incorporate either a touch of color with a pastel or a bold pop. 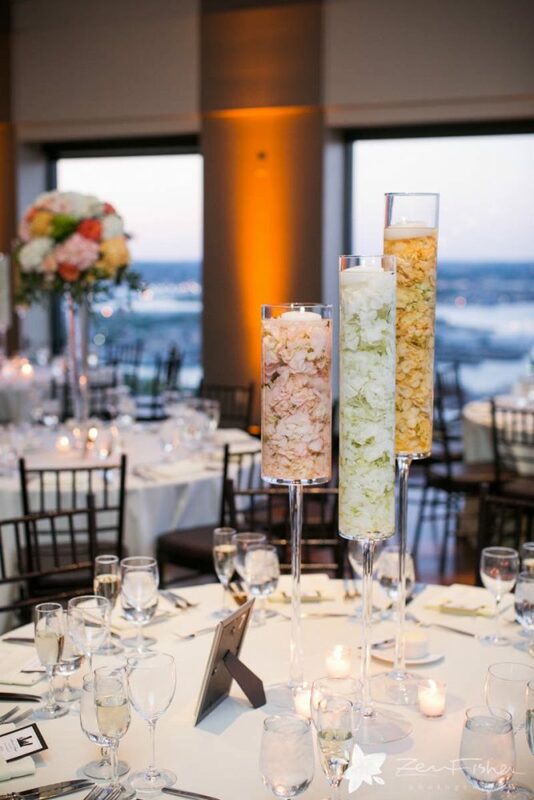 They are great in both bouquets or centerpieces. 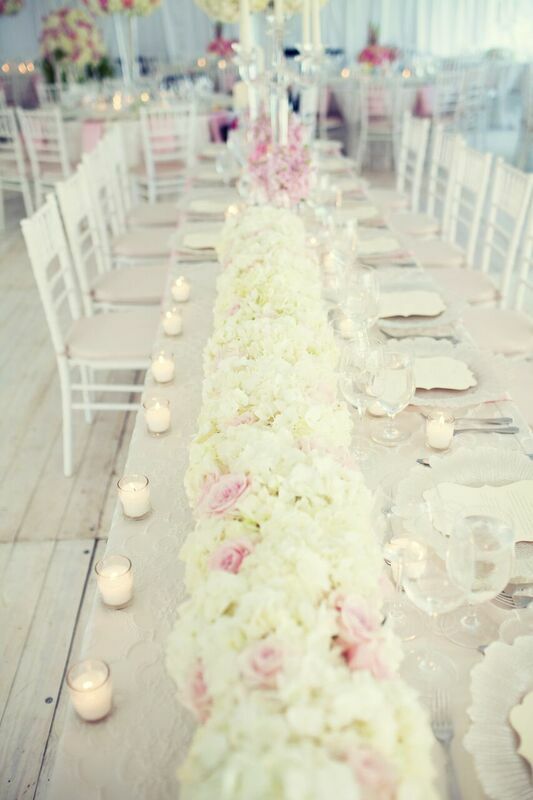 Are you in love with the look of peonies, but are planning a wedding outside of peony season, don’t fret! 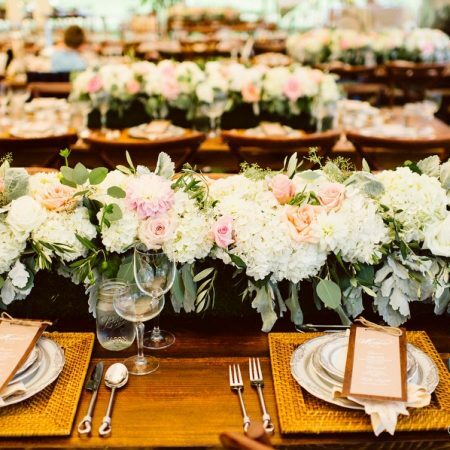 We can still help you build the perfect floral plan for your wedding. 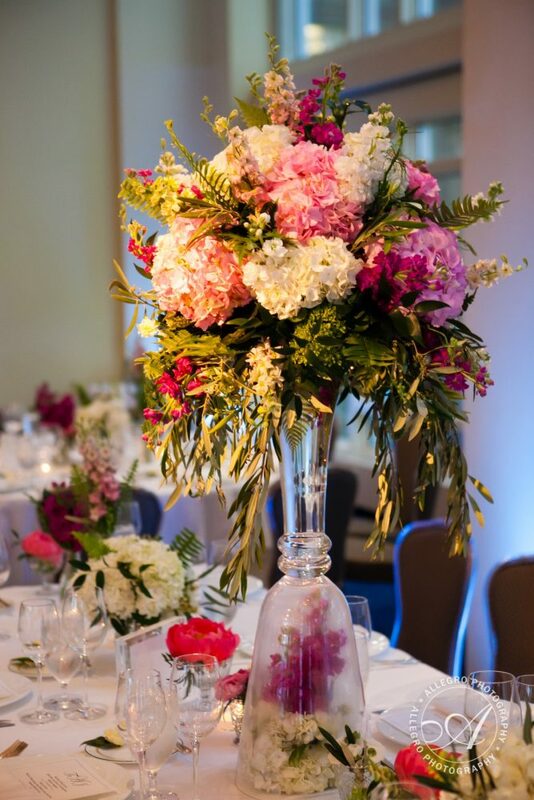 There is a variety of wedding flowers that look similar to peonies and are available outside of peony season. 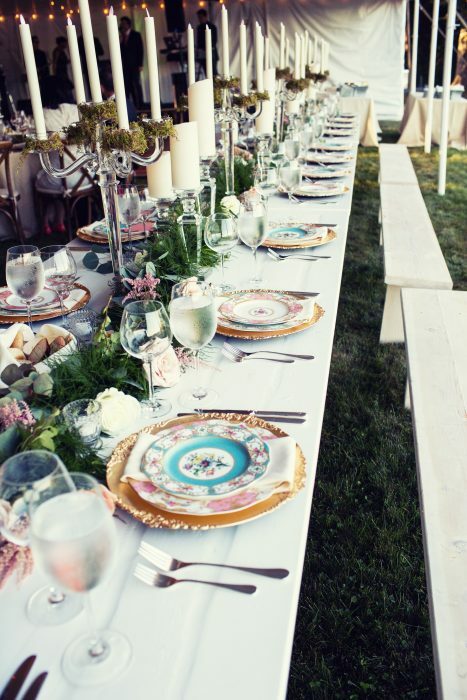 The sun is finally shining, and temperatures will again be soaring as we inch closer to summer wedding season. The summer brings so many options in color and design. 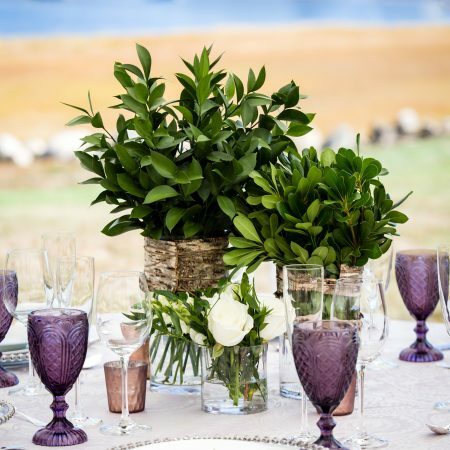 For all our couples planning a summertime wedding, we have compiled some of our favorite summer wedding centerpieces that are capable enough to endure the most scorching of temperatures and remain picture perfect throughout your special day. 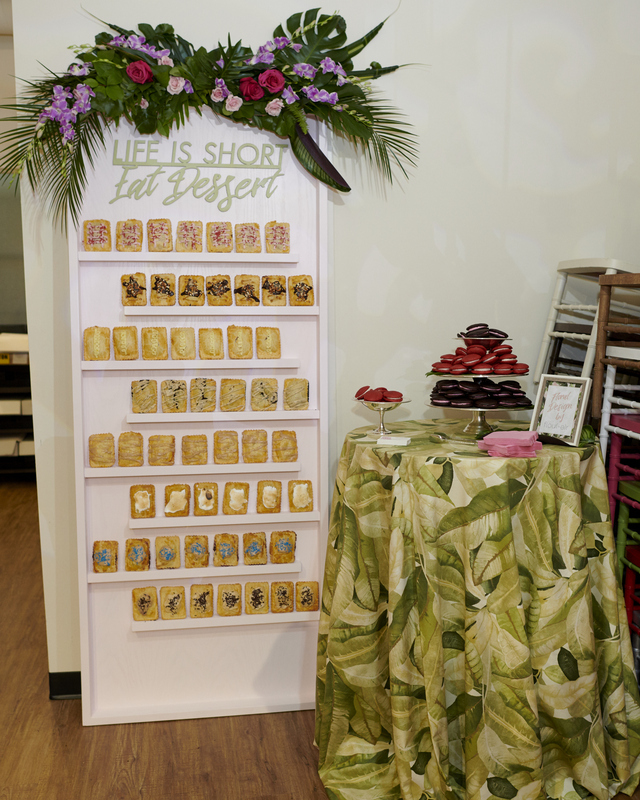 Embrace the vivid colors of the season by designing around all the brilliance that the summer season brings. From bright pinks, energetic oranges and vibrant yellows, the summer colors are so rich and varied. 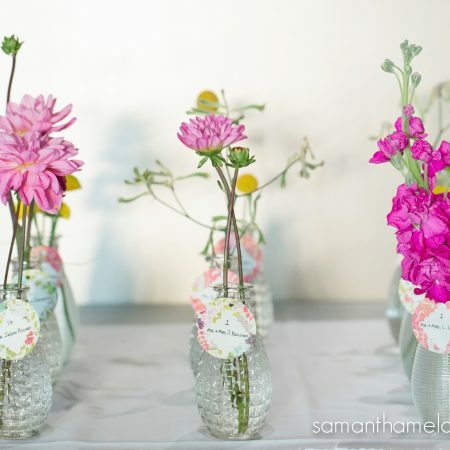 When the temperatures are soaring, keep your colorful blooms cool by submerging them in water. 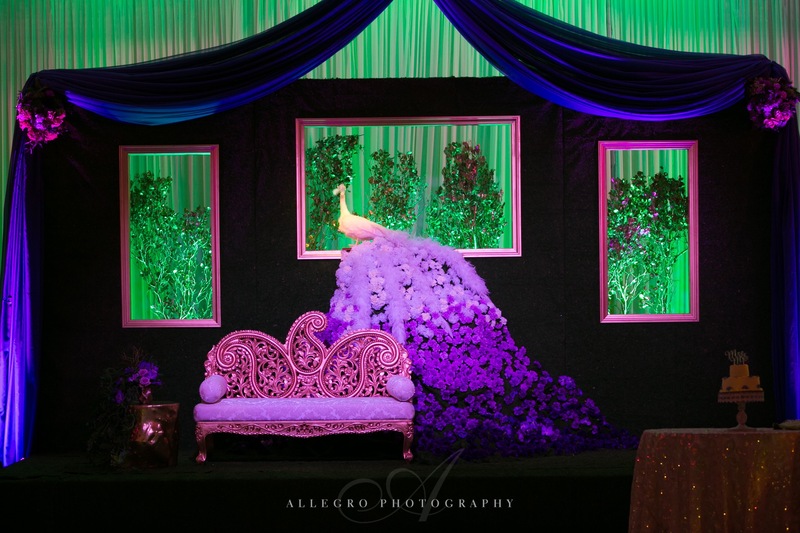 The colors will stay rich and vivid and create a romantic modern look to your wedding design. Sometimes going green is the best direction to go in during the summer months. They can beat the heat and stand up to a long day in the sun and create a lush, natural, organic yet lavish look. 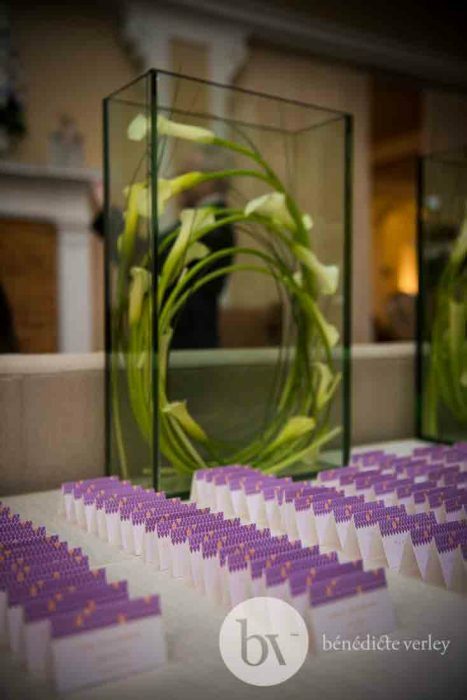 Using the color of white helps bring about a feeling of coolness and calm to your wedding day celebration. White creates a peacefulness to the environment, a refreshing feel along with a sophisticated clean design. 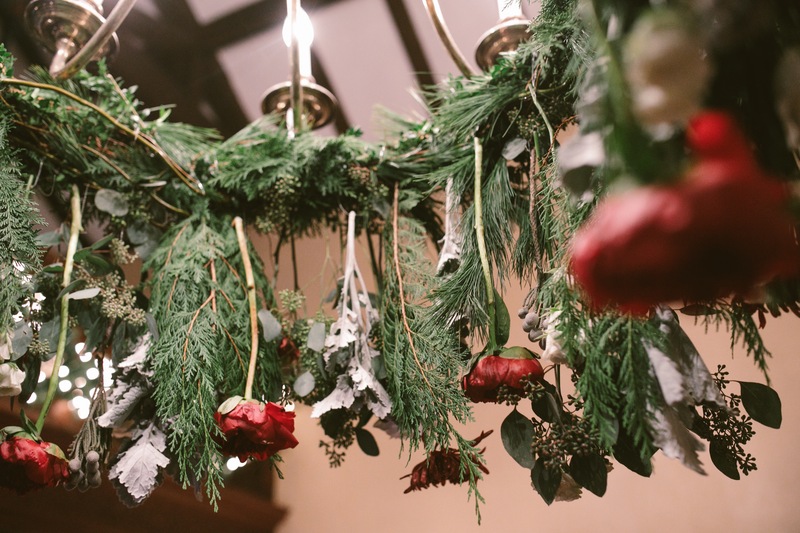 This special time of year brings so many more options for native seasonal flowers to be incorporated into your wedding design. 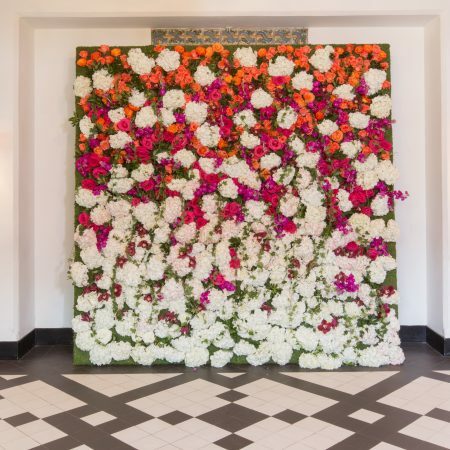 From hydrangeas to roses to dahlias, the summer season brings the availability of many couples favorite florals. 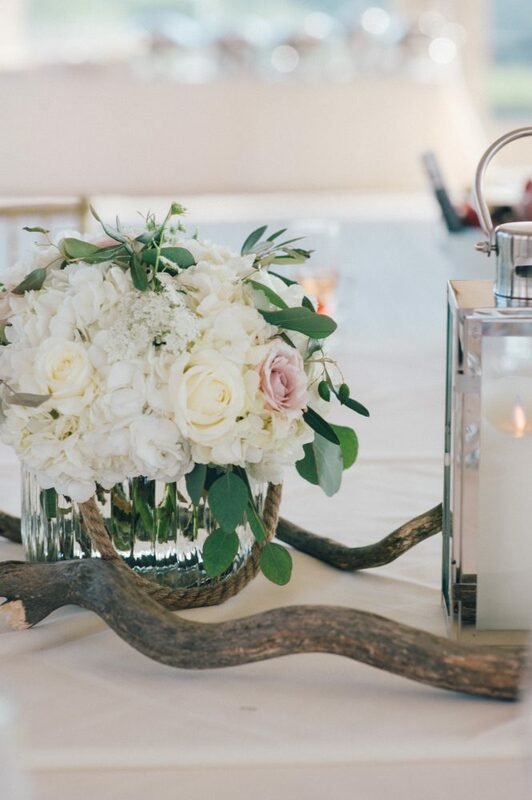 Sultry Summer Wedding Flowers; the best florals that beat the heat. 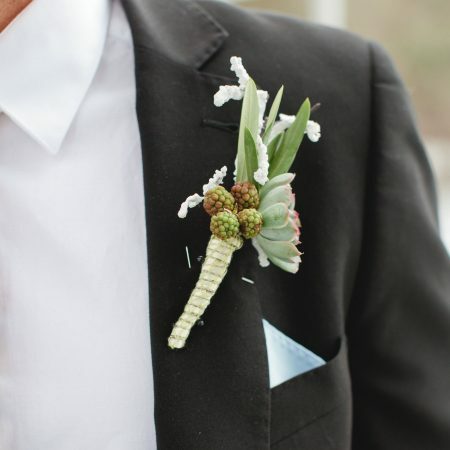 A sometimes-overlooked detail during the wedding planning process is the boutonniere. 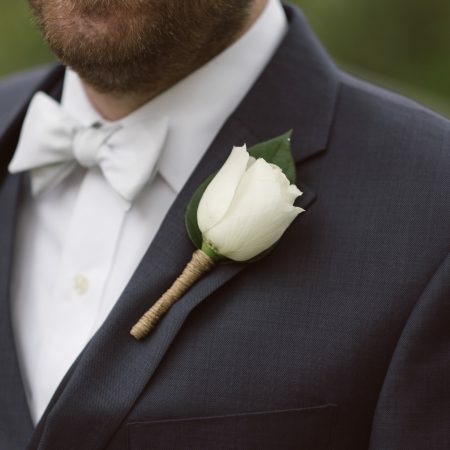 The groom’s boutonniere, worn on the left side, above the heart, is a symbol of fidelity and love. 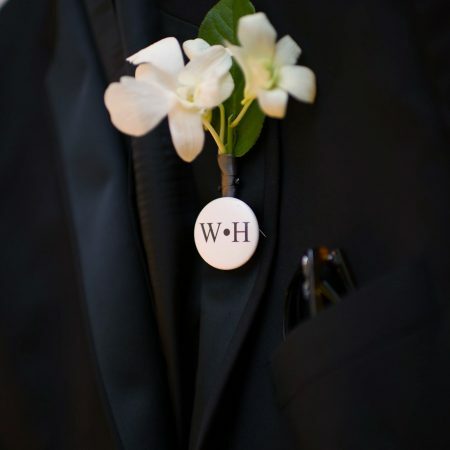 The style of his boutonniere and those of the groomsmen should be dictated by the type of wedding, the groom’s personality & attire, and the florals selected along with the color scheme and design of the wedding. 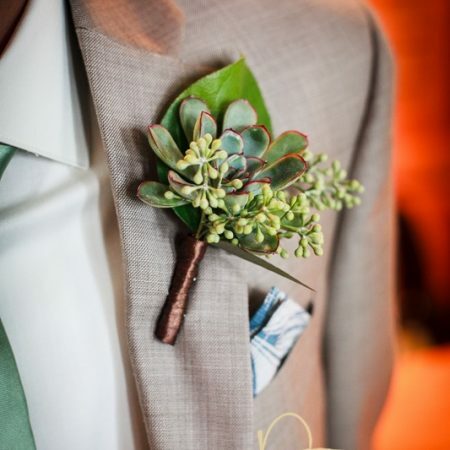 The groom’s boutonniere should match in style the rest of the wedding party but should be slightly different to distinguish him from the rest of the groomsmen. 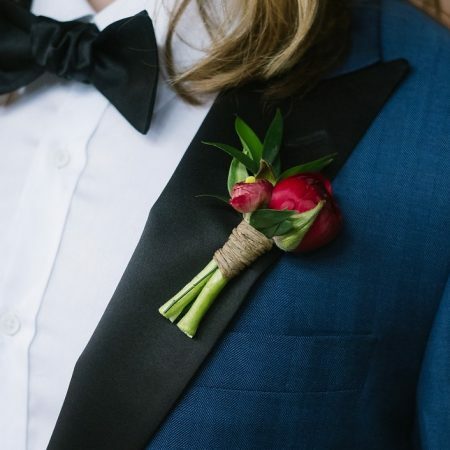 It is always a nice touch to match the boutonniere to the style of the bride’s bouquet and the groomsmen’s boutonnieres should complement the bridesmaid’s bouquets. 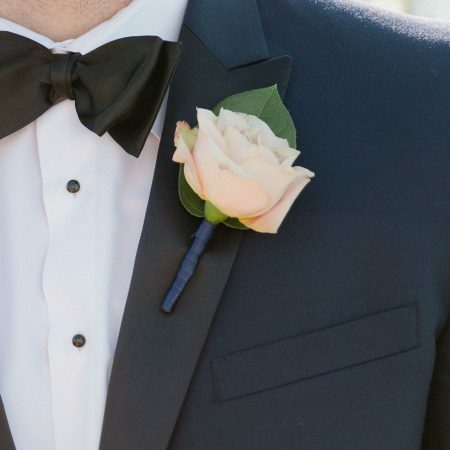 The following are styles that can help you determine the direction you want to go in for your big day. 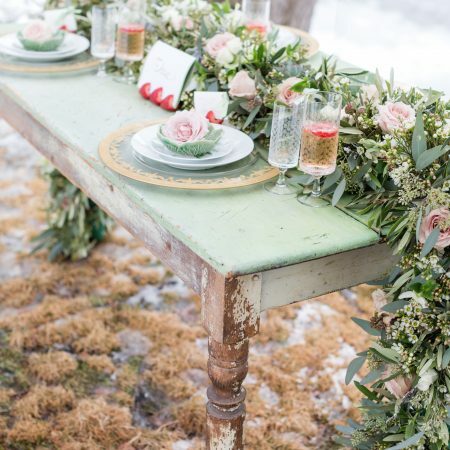 Natural elements such as leaves, twigs, feathers, berries, and twine are the perfect touch to complement a rustic, outdoor or woodland inspired wedding. 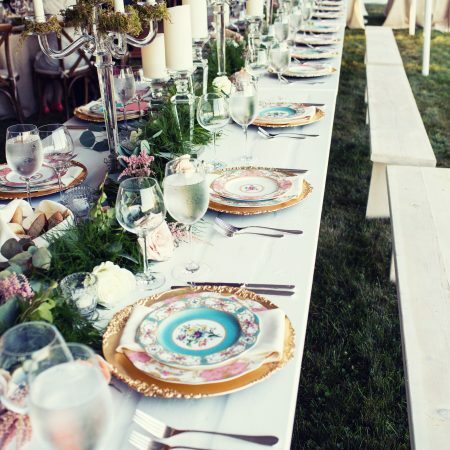 Dried flowers, lace, and succulents are also a nice addition to this style of wedding. 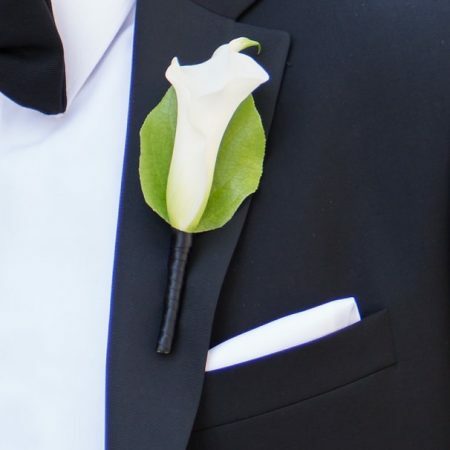 For traditional style weddings, lean toward the simple and elegant calla lily, English spray rose and even the classic rose in clean crisp colors. A charming romantic look is created by using delicate ribbon and lace along with a selection of old-fashioned style flowers which are soft and delicate in nature. Wire, silk cords, bold shapes and brilliant colors are the direction of a more modern and contemporary style. 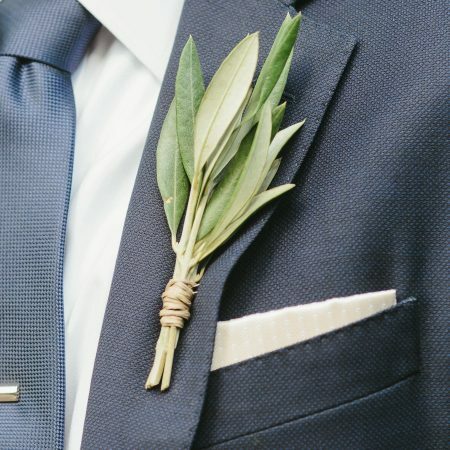 Non-floral elements such as pins & broaches as well as unique greens with a strong shape and color are best to use when creating something unique for the groom and the rest of the wedding party. 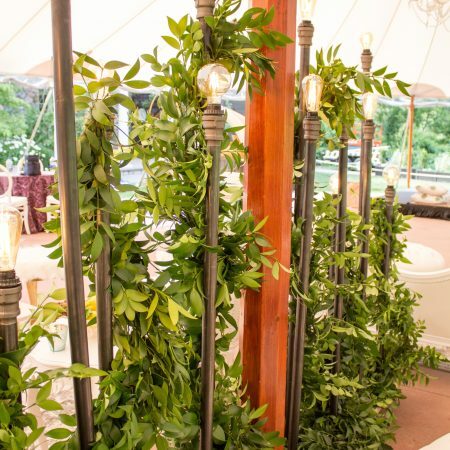 The use of herbs, mini wreaths as well as pieces such as golf tees are all fun alternatives. Though UltraViolet is the color of the year, classic Navy is back. Deep navy blue paired with rich silver chrome elements will rival the classic black & white of past seasons. 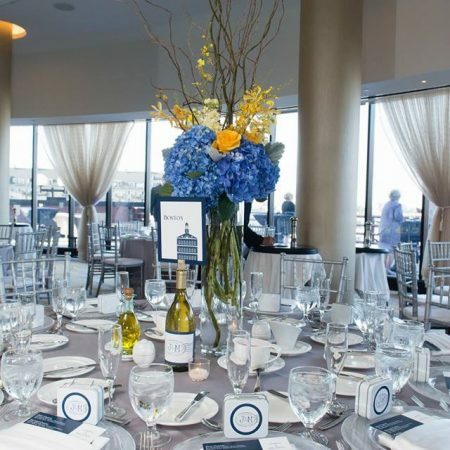 Here in New England, nothing is more beautiful by the water than elegant navy coordinated with chrome details not just for décor but wedding party attire and invitations which are setting the tone of these elegant weddings. 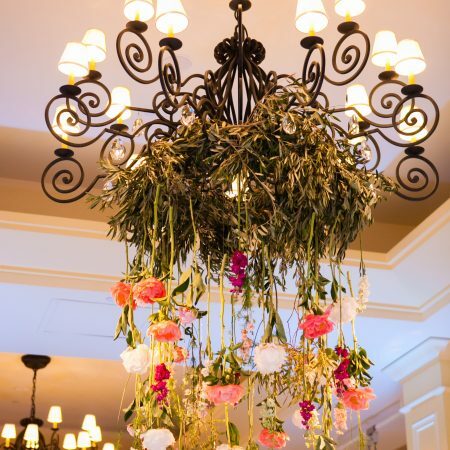 Still going strong this wedding season, hanging floral arrangements. 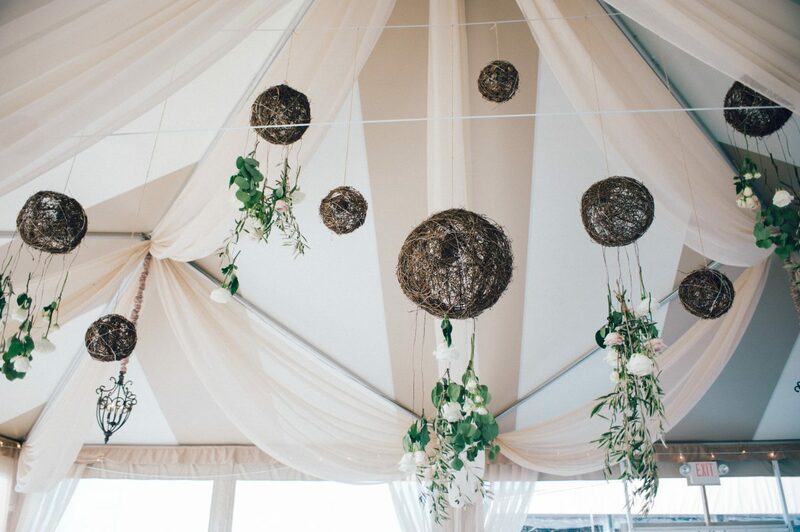 Suspended florals bring such a beautiful romantic feeling to any space, decorating it from head to toe while keeping your tablescape less cluttered and allowing each piece to shine. 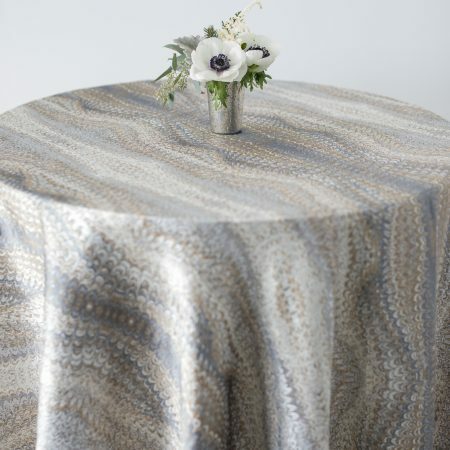 Texture can be brought in almost anywhere-from the wedding dress to the table décor to the wedding cake to a “living bar.” There are so many options for different textures and elements for each aspect of your wedding details. 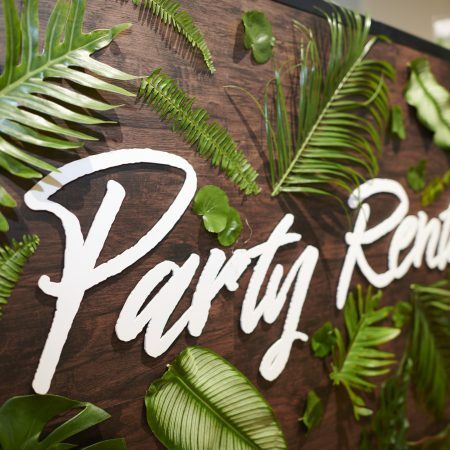 Gorgeous paper for your invitations, textured florals and backdrops these pieces bring the outside in and will show beautifully in your photographs. “Woodsy” boho style is here to stay, especially here in New England. 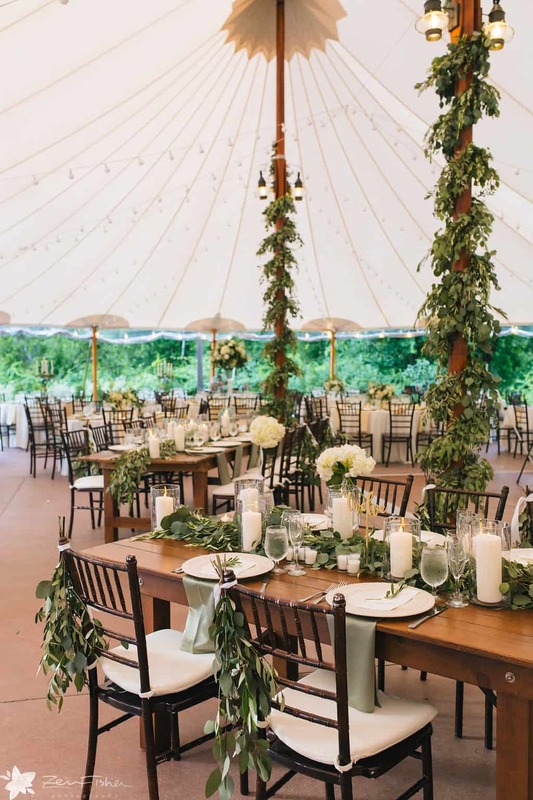 Tables dripping with garland, cascading bouquets with vines, twigs and big blooms, mantels and stairwells wrapped in greenery is what we will be designing this coming wedding season. 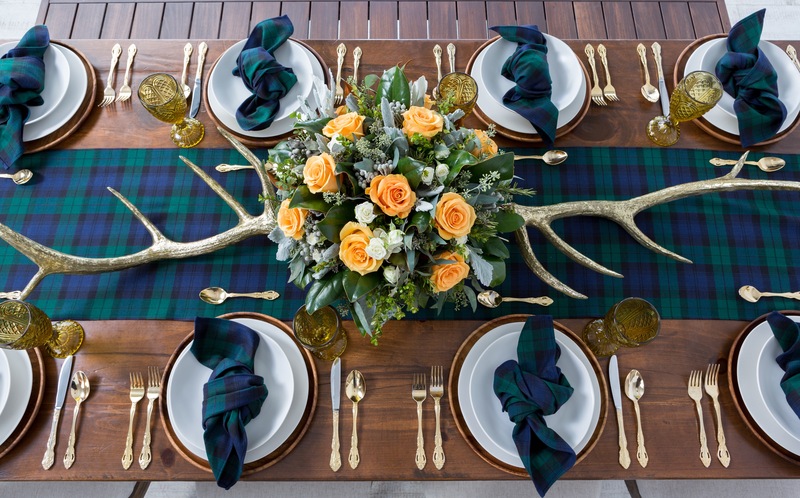 We love this rich and abundant feel full of natural textures. Trends and styles will change. 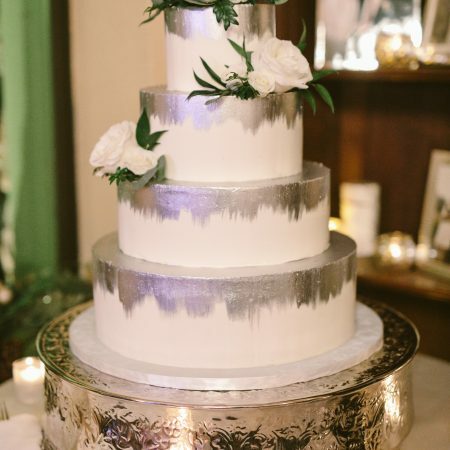 We help our couples pull from all these styles and trends the pieces that feel like “them” and create a wedding design that is truly unique and full of elements that create a day that is all their own. You’re Engaged! Let’s plan a wedding. Congratulations on your engagement! This is such an exciting time in your lives. But, it can be a stressful one as well if you are not organized in how you take care of all the planning that needs to be done. We hope that we can eliminate some of that stress so that you can enjoy all the special moments that are to come. 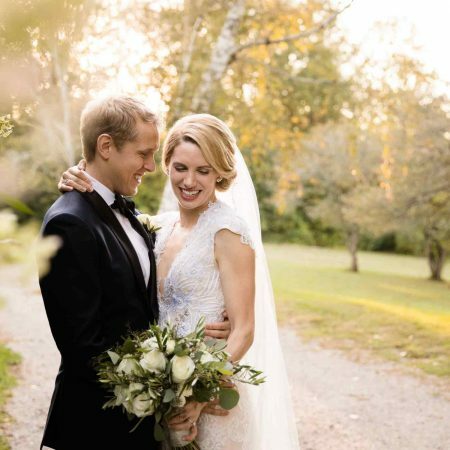 Read on for our advice on planning for your big day. 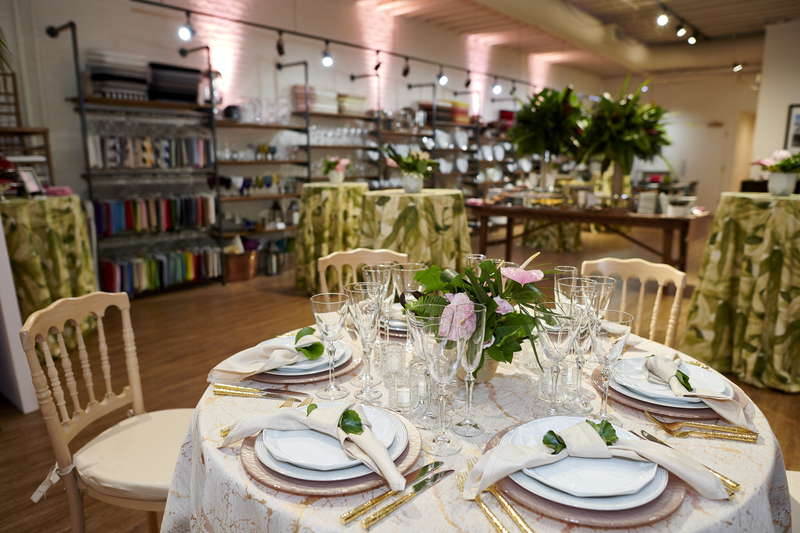 Though you can start design and décor dreaming, planning really starts when you decide on the date for your wedding. 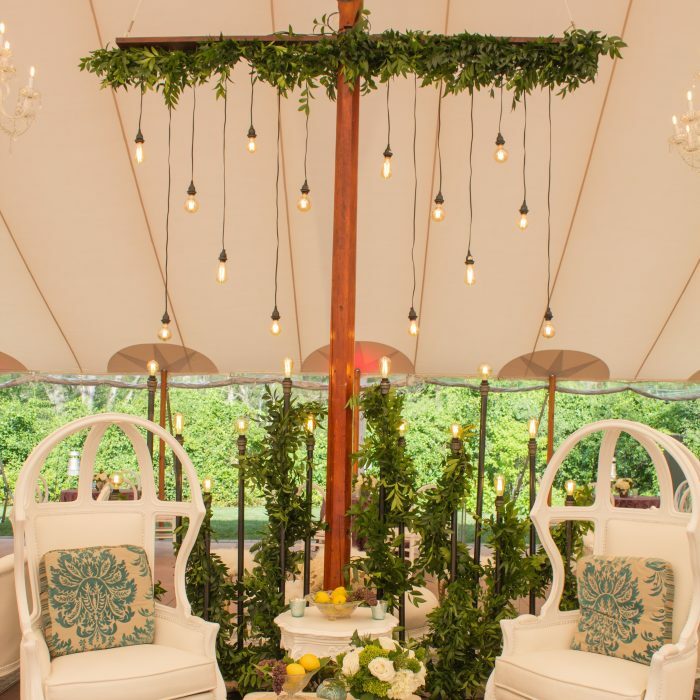 Having your wedding date, or at least a set of possible dates, will help determine the direction for your wedding venue as well as church/ceremony site and other wedding professionals. 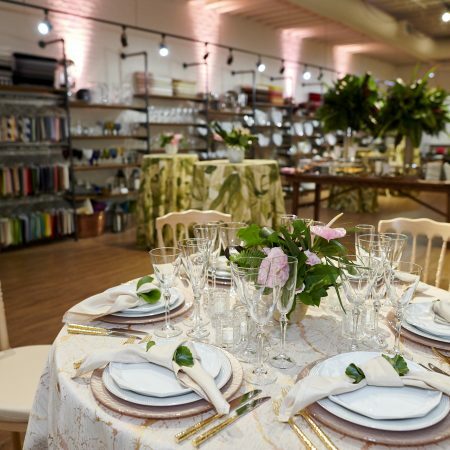 It can be challenging handling all the details of the wedding planning process. There are so many decisions that need to be made, appointments to be set, and connections needed. 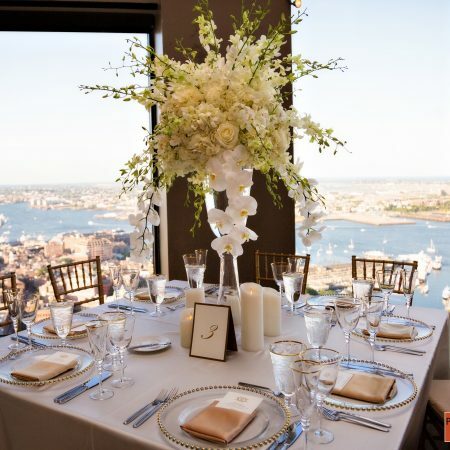 Leave all this work to a professional event planner and enjoy being engaged and all the upcoming wedding festivities. 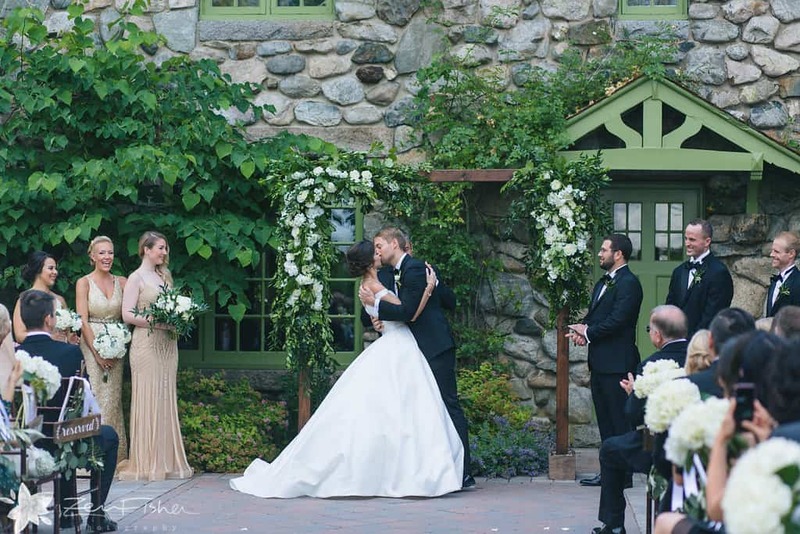 Professional wedding planners take the pressure off of you. 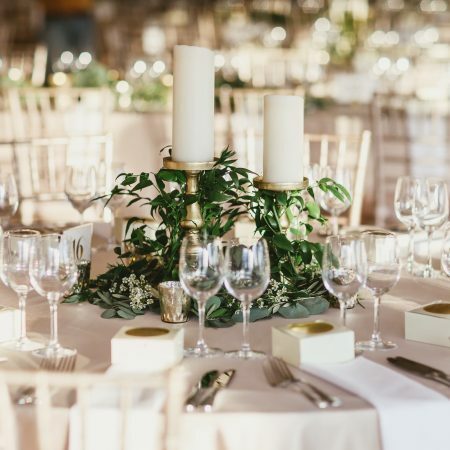 They will take care of all the details, connect you with the best suppliers and will ensure that you are the picture of wedded bliss. 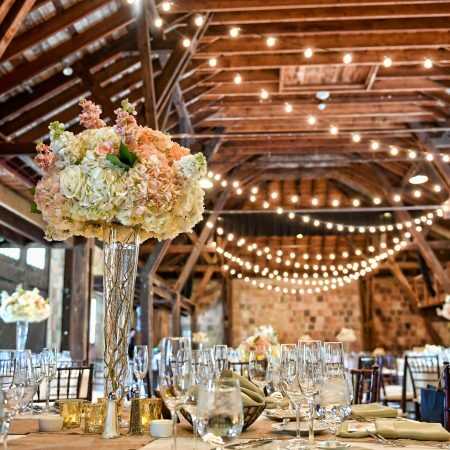 Let your family and friends know about your engagement and the wedding date and start to set the tone of your wedding celebration. 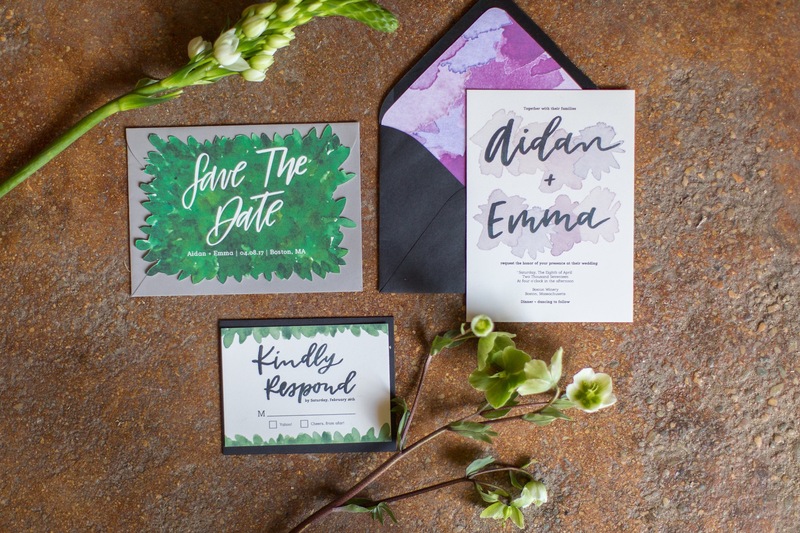 The save the date and/or engagement announcement is a great way to introduce the style of your upcoming wedding celebration. 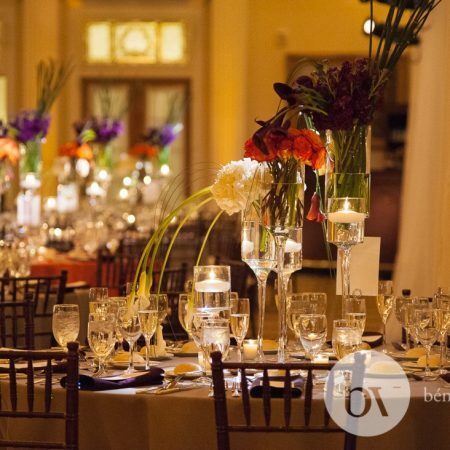 Booking your venue early on in the process allows for all of the other wedding details to fall much easier into place. 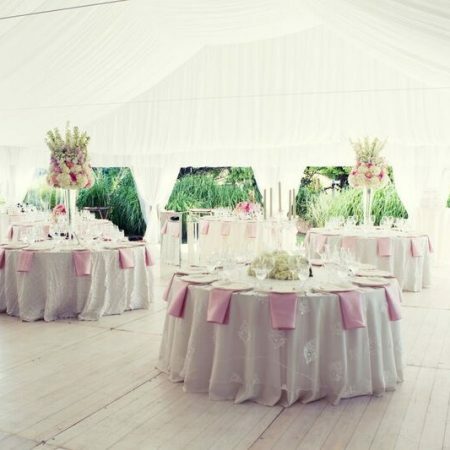 Wedding venues, especially popular ones, book up at least 12 months in advance. 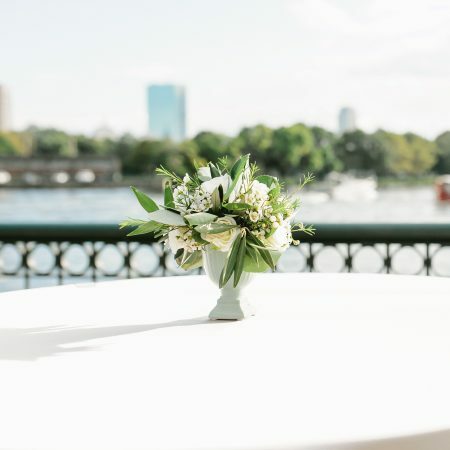 Receiving wedding proposals from wedding professionals becomes much easier once they know and understand the venue where you will be hosting your big day. 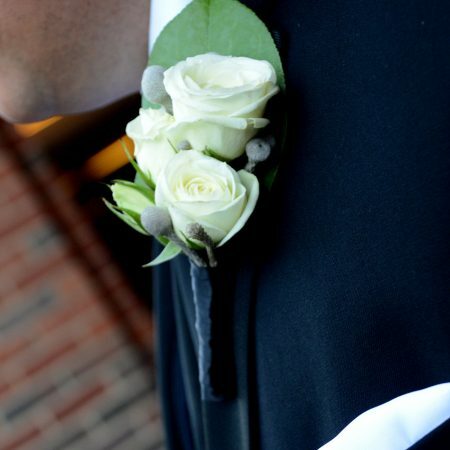 Bride and bridesmaid’s bouquets as well as groom and groomsmen boutonnieres. 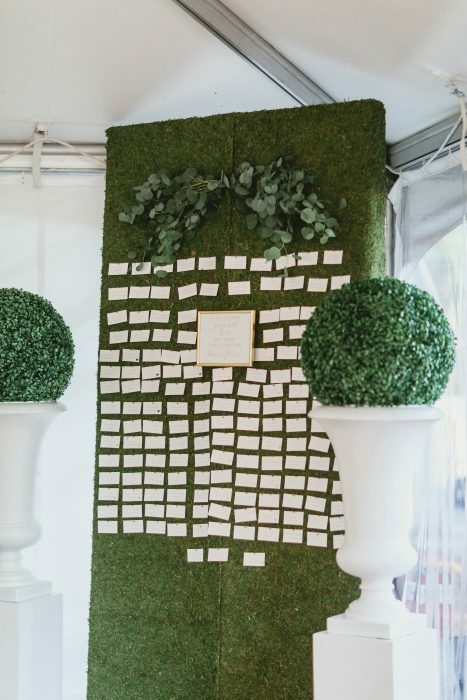 Descriptions of other ﬂowers you would like to have as a part of the wedding ﬂoral experience such as backdrops, ceremony displays, aisle décor, and more. Wedding dresses, bridesmaid dresses, suits and tuxedos -fabric samples are very helpful. 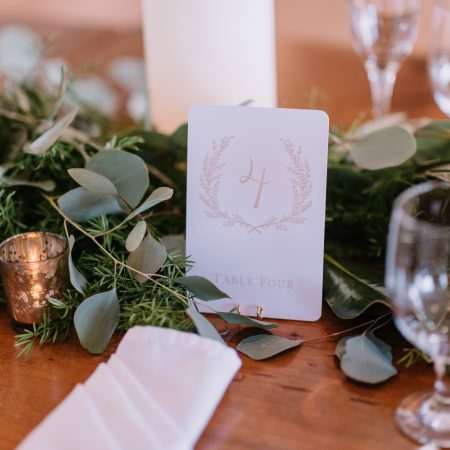 Other wedding design and décor inspiration photos including tabletop design, lighting, candles, etc. 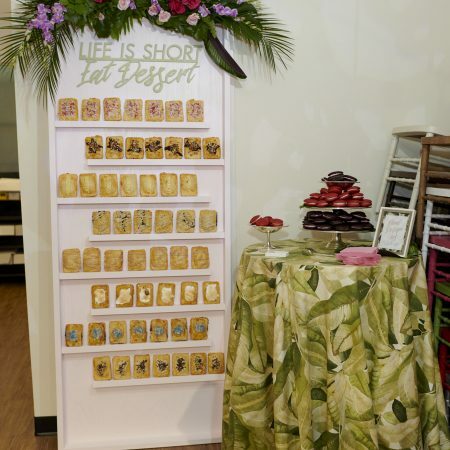 One of the more difficult parts of the wedding planning process is planning your budget. It can be overwhelming. 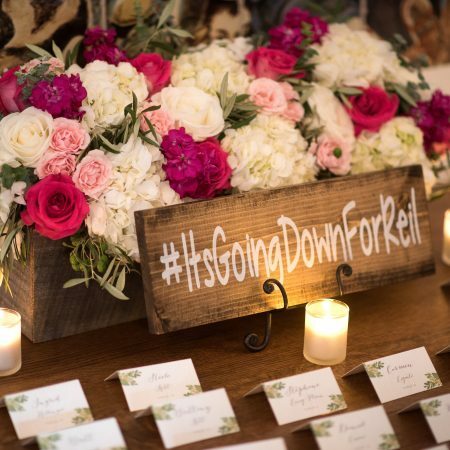 Knowing what actual costs are as they relate to a wedding can be challenging. 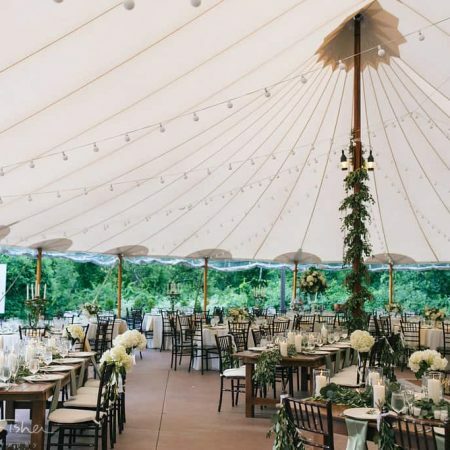 Determining a total budget figure, however, allows your wedding professional to have a starting point to work from in planning for all the details. 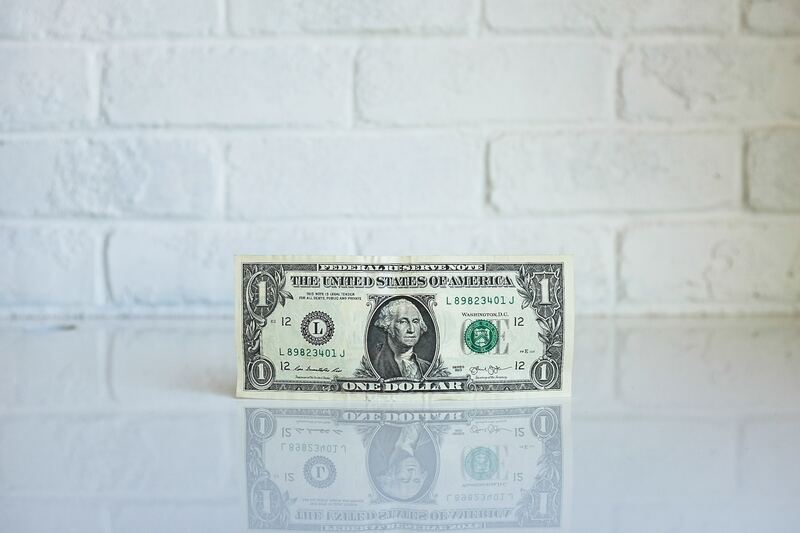 Be upfront about your maximum budget-it will save time, energy and help to eliminate some uncomfortable situations. We love big ideas, creative thinking, and imagination. We are excited for any opportunity to be unique. So, go for it-we are ready for the challenge. 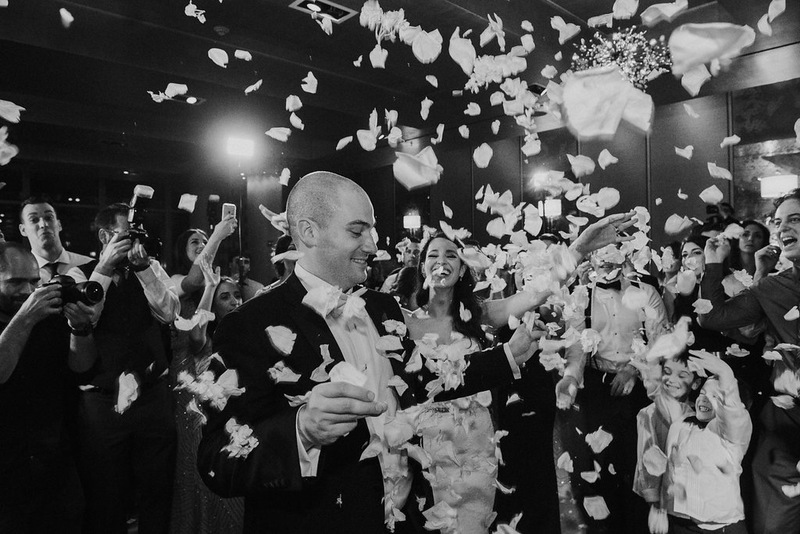 From the engagement parties, showers, bachelor & bachelorette parties to the honeymoon take the time to enjoy each moment of these special celebrations with family and friends.